We are up early, after a quick stop at a local bakery for croissants, oj and coffee we are back on the road. 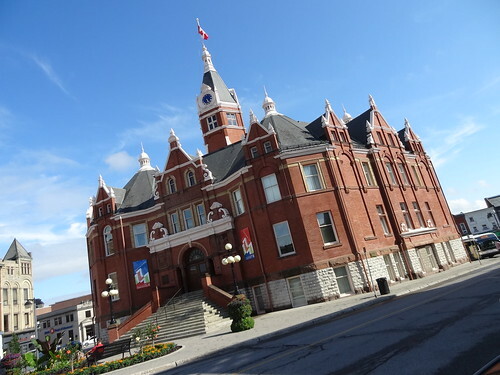 In under an hour we arrive in Stratford, Ontario; you probably think of Stratford as the home of the Shakespeare Festival, which, of course, it is, but this lovely little town has more to offer than just theatre. The townsite and river are named after Stratford-upon-Avon in England. The Grand Trunk railway arrived in 1856 with the Buffalo and Lake Huron Line, in the 19th century it had become a Canadian railway hub and a center of furniture manufacturing. The architecture is distinctly Victorian, gorgeous brick buildings line the streets, gardens are found throughout the city, it is an arts, culture and culinary hub. 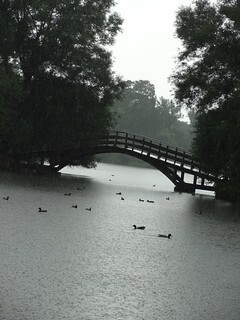 Unfortunately it has started to rain, but that will not deter us from enjoying our visit. 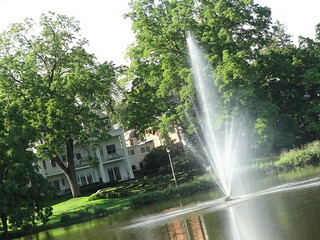 The length of the river through town has been designed as a park, complete with walking trails and benches; fountains spout sprays of water skyward, lovely homes rest along the opposite bank of the river. 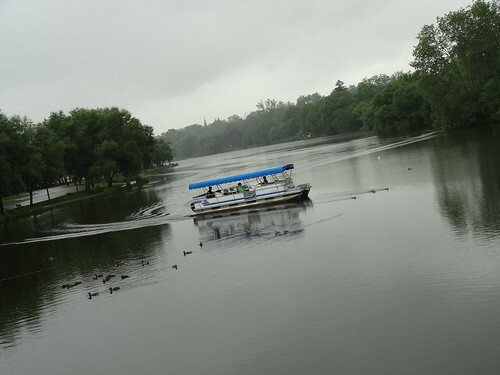 We begin our walk along the shore, mature trees shelter us from the heavy rain that has begun to fall, a lone pontoon braves the weather. 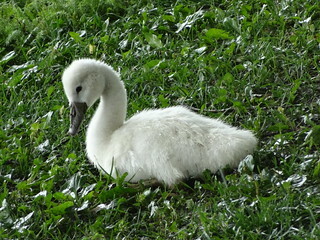 Walking on, swans have come ashore, there are several adults and multiple youngsters. Mallards are everywhere, a park employee has arrived on the scene to feed the ducks, she tosses handfuls of food into the surrounding grass, it is a lunchtime free-for-all. Out in the water a trio of empty gondolas wait patiently for the weather to improve. Looking out, the grounds are lush in varying shades of green, every so often we come upon a bridge spanning the river; made of wood, concrete or brick, each is distinct and special in design. In the distance the turret of a castle-like building peeks over the tree tops, the weather cannot make up its mind if it wants to rain or get sunny. 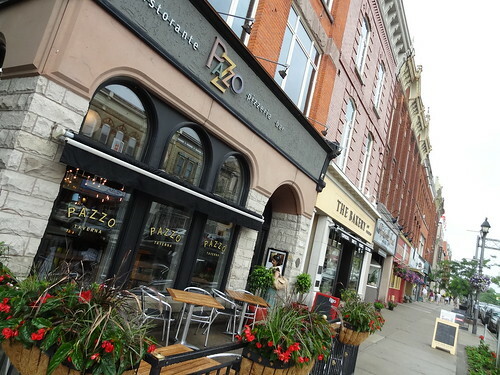 After walking both sides of the river we make our way downtown to Ontario street, lunchtime has arrived and Pazzo Taverna looks inviting. 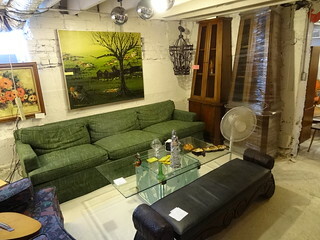 The cellar of the restaurant serves pizza and pasta, perfect! 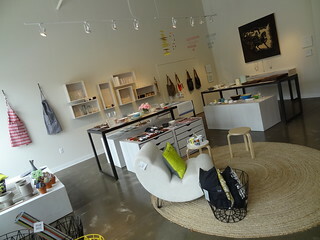 It feels good to be out of the rain, the contemporary interior feels cozy. 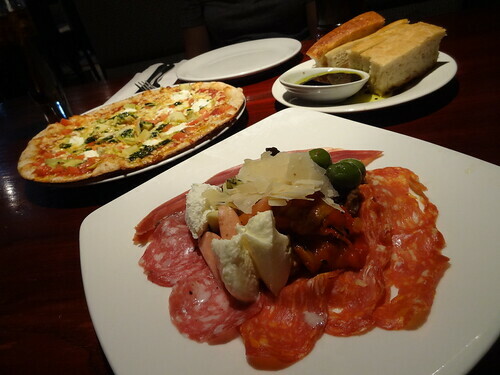 Deciding on a pizza and antipasti plate, we sit back and relax as we wait for lunch to arrive. First out is a fabulous focaccia bread served with olive oil and balsamic vinegar, it is hard not to eat it all. Next to arrive is the antipasti plate, a marvelous assortment of thin-sliced meats, olives, cheeses and roasted red peppers, everything is delicious. The thin crust pizza is excellent…..we finish absolutely everything! This can only mean one thing…..we need to do more walking. 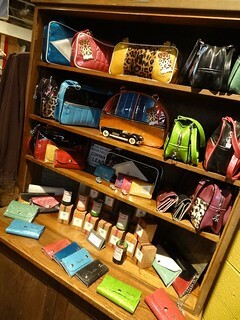 Outside we are happy to see the rain has stopped, we can put our umbrellas away. 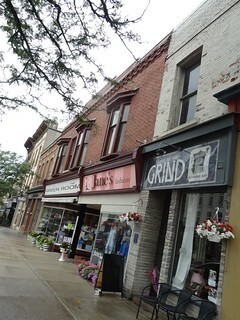 The buildings of downtown Stratford have remained in-tact, they are filled with galleries, cafes, home goods and clothing stores and specialty businesses. There is at least one bank on every block–handy if you need to exchange money. 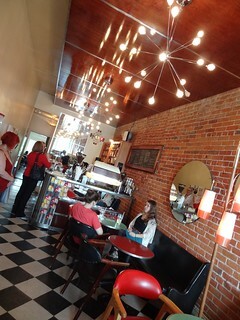 Inside a doorway a sputnik light fixture catches our eye, turns out it is a coffee shop; funky decor, fresh baked goods and iced coffee, it’s our kind of place. After browsing the shops we walk the opposite way along the river to the Shakespeare Garden, pathways lead us beside a fragrant Rose garden. 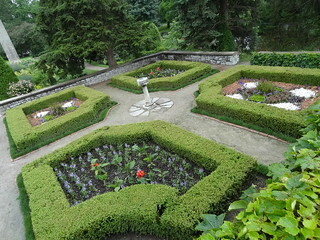 Designed by landscape architect H B Dunnington Grubb, the garden opened in 1936; at that time it was filled with plants mentioned in Shakespear’s plays. Today manicured hedges surround beds of annuals, a wonderful mix of perennials give the garden a different look throughout the summer months, a bronze bust of William Shakespear was installed in 1949. The sky has turned a brilliant azure, what a difference a couple of hours makes! We re-trace some of our steps so Kris can take some photos. 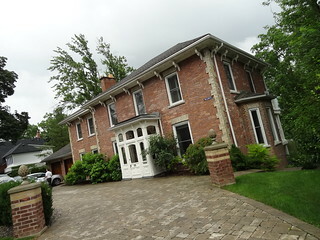 In surrounding neighborhoods brick Victorian homes are prevalent, many the yellow color found so often in Ontario; well manicured and decorated with lots of wood details, I encourage you to stroll along at least one residential street while you’re here. Back in London we freshen up then head out for dinner. Wortley Village is only a few blocks away from our Inn, inhabited by independent shops and restaurants, we saw several places that looked enticing. 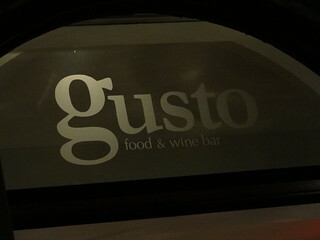 Gusto Food and Wine Bar is open late and offers patio seating, just what we are looking for. 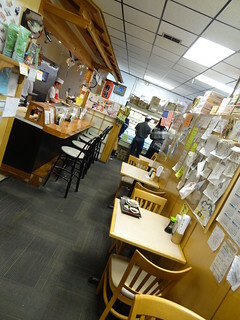 In addition to entrees and salads the menu features a series of small plates; after reading over the selections and asking our waitress for suggestions, we place our order. The stuffed risotto balls are served with a sambuca pomodoro sauce, a fantastic dish, much larger than expected. The Flat iron steak tacos are tender and flavorful, last to make an appearance are the chips and dip; jalapeno crab dip, walnut goat cheese artichoke dip and Texas caviar (salsa) served with crostini and root vegetable chips, it is all delicious and way too much for just two people! The food and service were outstanding, definitely a place we’ll come back to. 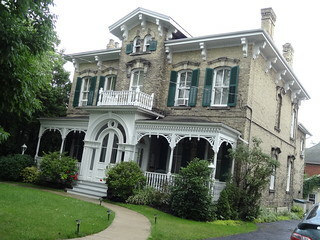 We are staying in the “old south” historic district of London, Ontario, at Idlewyld Inn. 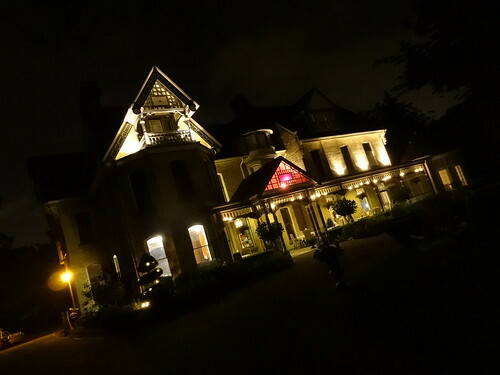 Built in 1878 as a private residence for Charles Smith Hyman, the (wealthy) mayor of London, it has gone from a family home to luxury apartments, a nursing home, a bed and breakfast and finally a historic boutique hotel. 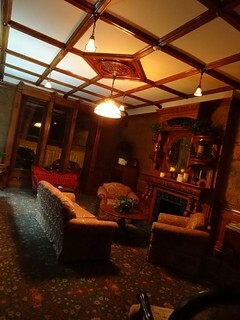 Visiting the Inn is like going back in time, designed in Victorian style, the interior is elegant, grand, luxurious. Floral print carpets cover the floors, antique fixtures glow with soft light, ornately carved wood is deeply colored and varnished to a high shine; it covers walls and surrounds the fireplace in the parlor. 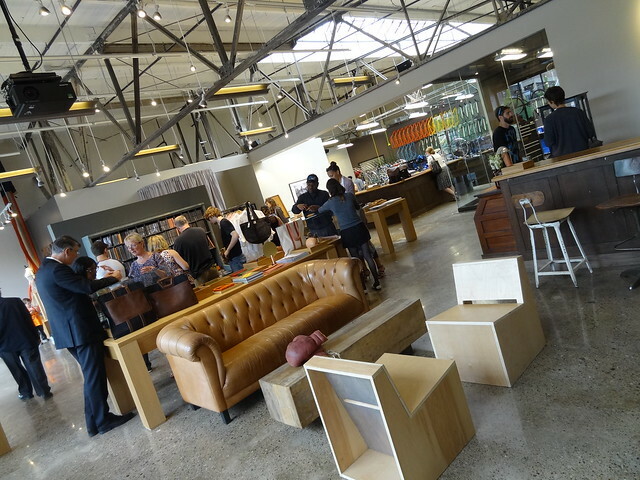 Ceilings are high, period furniture fills the public areas. 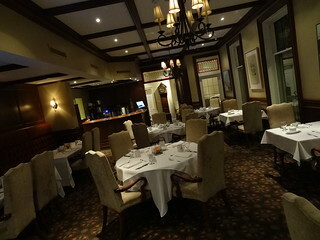 The original dining room as been turned into a sophisticated restaurant that is open to the public; serving locally produced meat, vegetables, fruit and herbs, their extensive wine list offers the perfect vintage to go with every dish. Idlewyld is home to 23 unique, well appointed guest rooms, we are staying on the third floor. 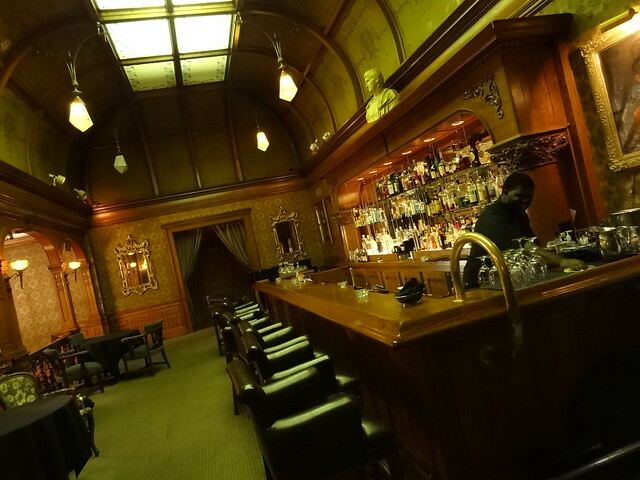 The hotel has maintained it’s Victorian charm while at the same time offering modern conveniences such as Wi-Fi , Jacuzzi tubs and an elevator. We have had a full day, time to get some sleep. 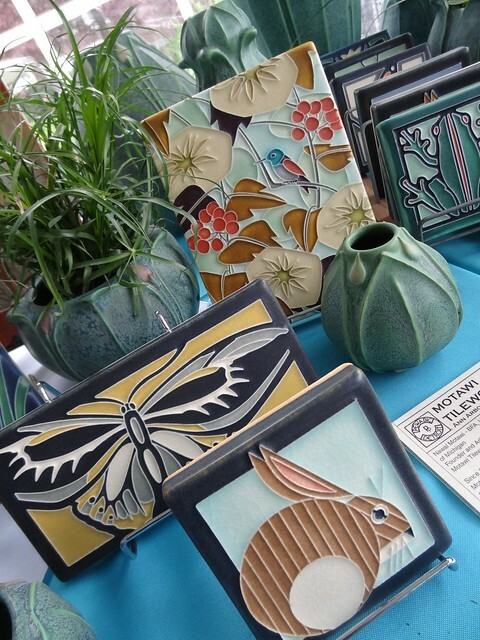 It is a lovely summer day, we have just arrived at Pewabic Pottery on Jefferson for the annual Home and Garden Show. A large tent occupies the paved parking lot, outdoors, large pieces are displayed among groupings of patio furniture, smaller pieces can be found in flower beds and along walkways. 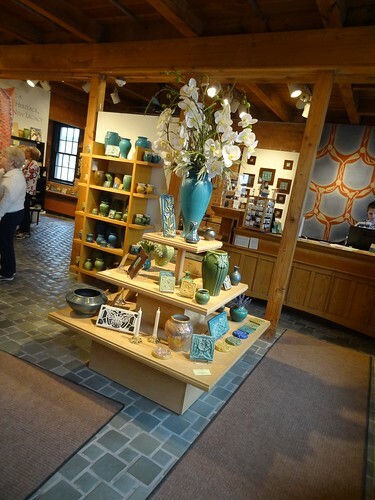 Inside the white tent, a banner hangs, this is Pewabic’s 110th Anniversary; tables are draped in turquoise blue cloths, topiary’s act as centerpieces, signature Pewabic pieces and t-shirts are available for purchase. 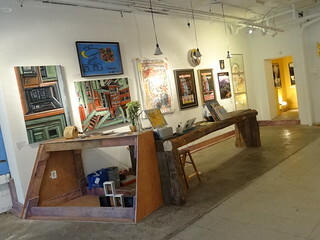 Artist’s tables line the enclosed space, we start from the back and work our way forward. Tiles are a popular item, one table features flowers such as Tulips, Daisies and Poppies, another table is lined with clay pieces shaped like Ginko leaves, the glaze is fabulous, going from milky to metallic. Motawi Tileworks has a fanciful selection of Arts and Crafts style pieces, I like the one with the bunny. 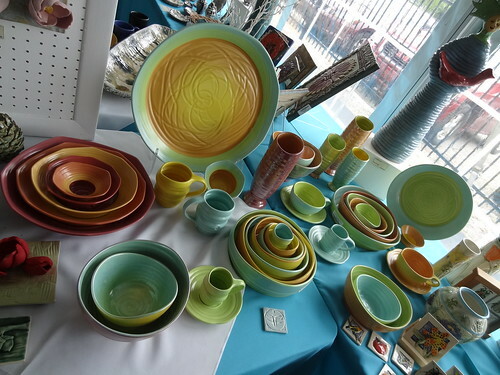 Further on, plates, nesting bowls, vases and cups feel free-form, glazed in turquoise, yellow and peach, they make me want to buy all new dishware. 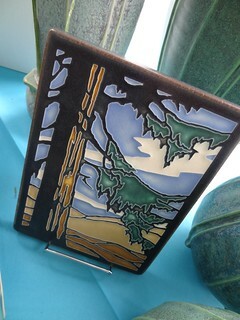 A tall tile reflects an up north scene, complete with a Pine tree, sand dunes and a lake in the distance. The next factory tour is about to begin, time to go inside. Pewabic Pottery was founded in 1903 by Mary Chase Perry Stratton, this Tudor revival style building was built in 1907 to house the factory. Pewabic is known for its vessels, tiles and architectural ornamentation for both public and private installations, Mary is known for her unique iridescent glaze. Pewabic pottery can be found throughout the United States including pieces in Washington DC, Houston, New York and the Nebraska State Capitol. 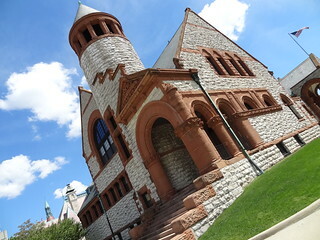 The building itself is a National Historic Landmark. Let’s go in. 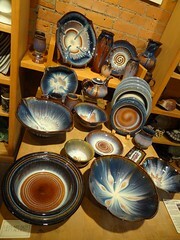 We start at the museum store, here tiles and vesselware handcrafted by Pewabic staff members are available for sale. 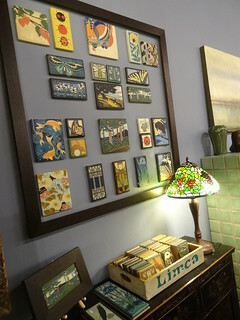 I see many signature pieces such as vases and tiles in colors such as blue, olive and gold. 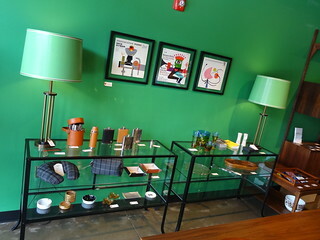 The next area belongs to the Gallery of Studio Artists, you will find a gorgeous variety of items such as mugs, vases and bowls in diverse finishes. 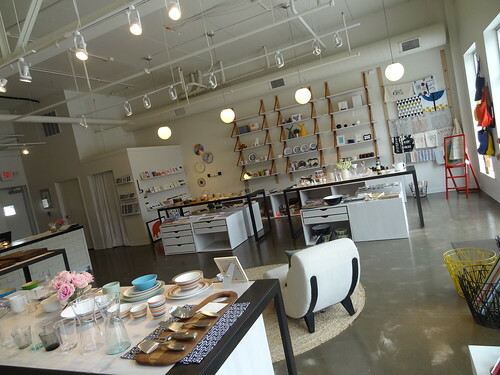 The showroom contains tile collections, samples of tiles and glazes, this is where you would come if you were interested in having something done for your house. 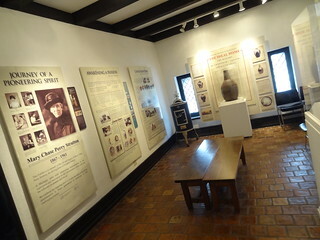 We climb a narrow stairway to the second floor, story boards and photos teach us the history of Pewabic Pottery and its founder Mary Chase Perry Stratton. We see an antique kiln and some of Mary’s early pieces, the room itself is quaint; leaded glass windows, black painted arches and door frames, and a stunning tile fireplace. 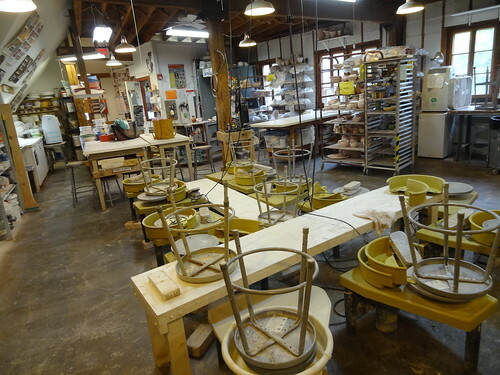 We proceed to the Kiln room, this is where the firing is done. 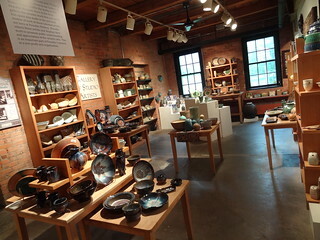 Think of a kiln as a giant oven that heats up to about 2300 degrees F, it bakes the soft clay pieces called greenware into a hardened piece called bisque, bisque is then glazed (painted) and fired again, the end result, the beautiful items displayed in the store. On the right are two “car” kilns, our guide points out tracks on the floor, kilns are pulled out on these tracks to be opened. 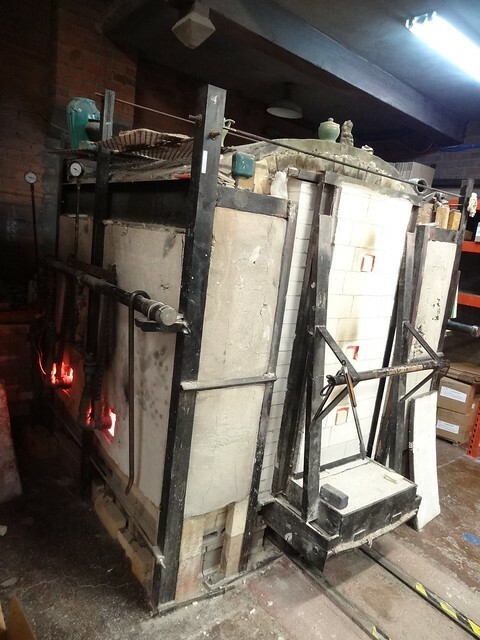 On the left is a fancy computerized version called an envelope kiln, I have to imagine it gets pretty hot in here when the kilns are on. 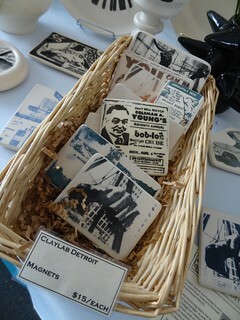 Pewabic makes their own clay, in liquid form it is called slip. We walk through the clay making area, stopping to see the belt-driven equipment, original to the building and used by Mary herself. 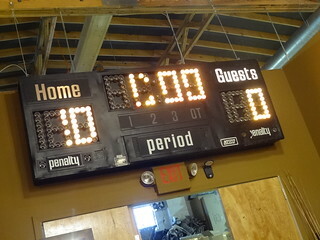 They make 1500 pounds of clay per week! 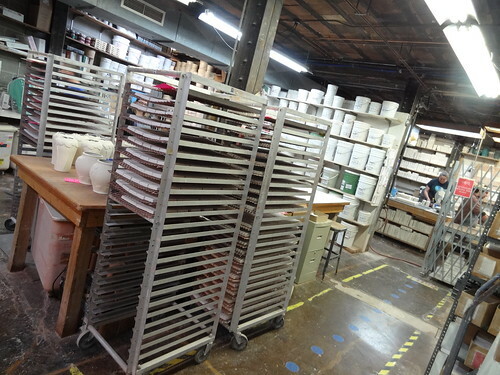 Further on we enter the Glaze room, all glazes are made here, shelves are lined with five-gallon pails filled with different colors. Glazes are applied by spraying, dipping or hand painting; tiles are usually sprayed, while vessels are usually dipped. Rolling racks are filled with glazed pieces ready to go into the kiln, the colors are a mystery to me at this point, as they completely change and come to life in the firing process. 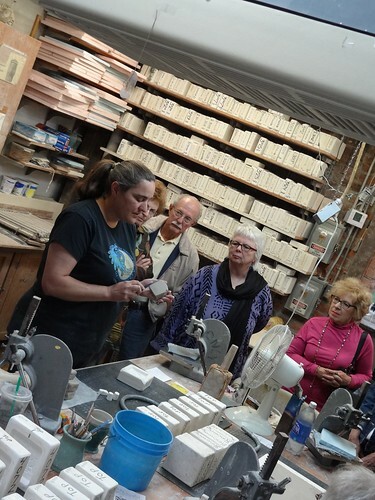 In the tile pressing area a woman is showing us how a tile is made, a square chunk of clay is placed in a plaster mold, working with her thumbs she presses the clay evenly into the mold. She picks up a different mold that has been sitting about a half hour and gently coaxes the tile out by tapping it on the table, an image of a bumblebee surrounded by a honeycomb pattern appears. 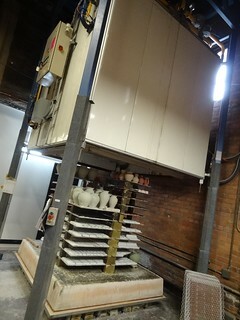 When the clay is completely dry the piece is cleaned and placed on a rack, when enough pieces are ready they will be loaded into the kiln and fired. We end our tour upstairs with a visit to the Education studio, this is where classes and workshops are held. The room is lined with works-in-progress, students work at tables and benches, there is a small classroom area for children. There is no class today, but a few students are hard at work. Downstairs we pass through the store area once more, there are so many beautiful things to look at. 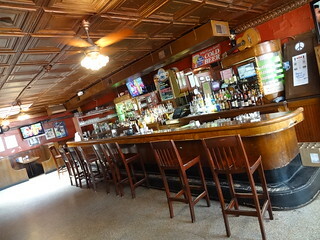 We decided to choose somewhere close to have lunch, Andrews On The Corner is just down the road on Jos Campau at Atwater. The temperature has gotten steamy, so we choose to eat indoors, our waitress greets us with menus and glasses of ice water. 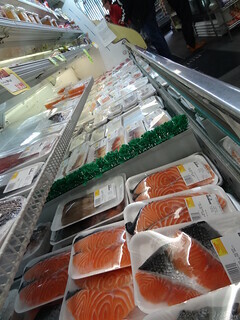 We glance at the selections; soups made from scratch, salads, burgers, fish and steak, it all sounds good. 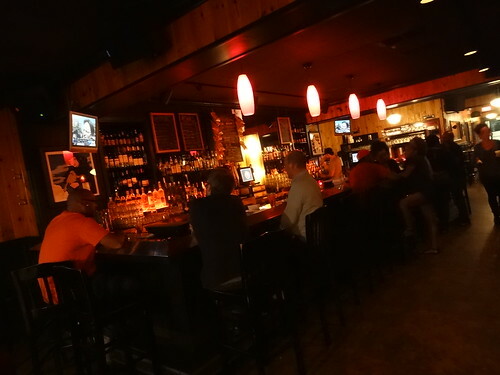 The room is on the dark side, in that dive bar sort of way, dark wood floors and wainscoting, walls are deep red, wood booths line the perimeter of the room, the bar is the centerpiece. 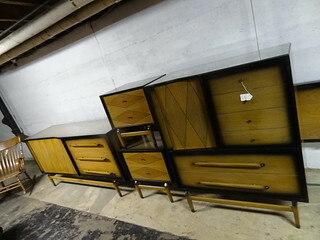 The cabinet behind the bar is a handsome piece, in the center an art deco style mirror reflects the light, glass block flanks each side. 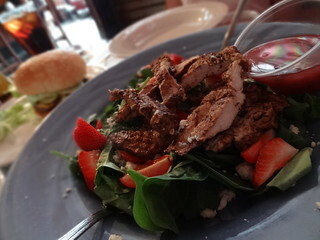 Just like that, our food arrives; the grilled jerk chicken salad is plentiful, the chicken sits atop a bed of spinach, strawberries and feta cheese are sprinkled about, raspberry vinaigrette is served on the side. The chicken is cooked perfectly, the combination of flavors a winner. 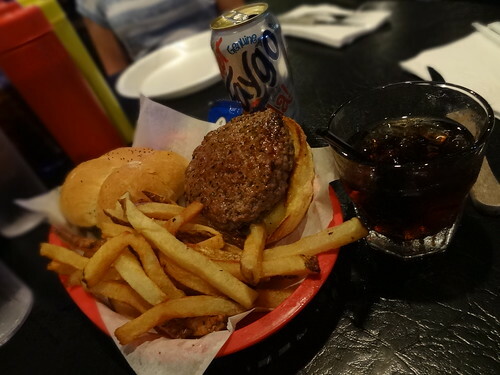 The Ground Round burger is also good, we shared both things, making for a nice light lunch. 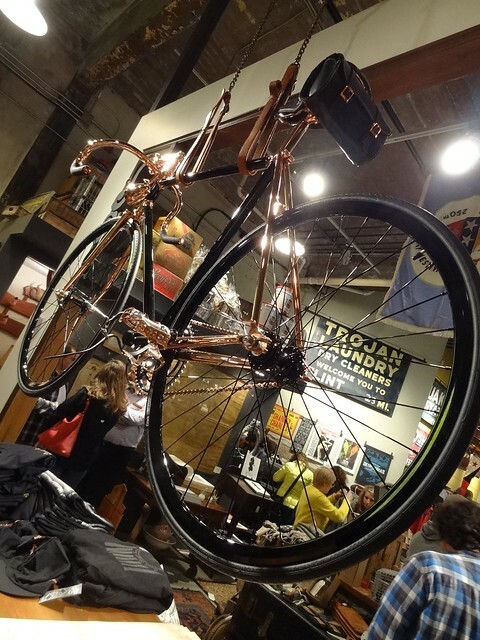 The Atwater Brewery is just down the street on Jos Campau, housed in a 1919 factory warehouse the brewery itself was founded in 1997. 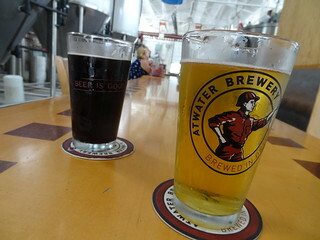 In case you are not aware of it, Atwater has its own taproom right inside the brewery, who doesn’t like a cold beer on a hot day? We pull up a seat at the bar, after a brief description of what’s on tap, we make our decision, a Summer Time Ale for Kris and a half Vanilla Java Porter, half Decadent Dark Chocolate Ale for me. 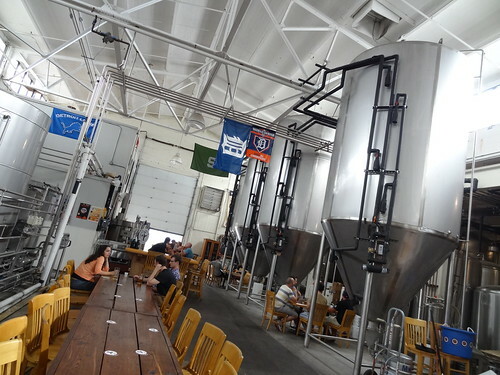 As we sip our beer we look around the brewery space, the main brewing equipment is Kasper Schultz brought in from Germany, malt and hops for lagers are from Germany, while American hops are used in specialty ales. 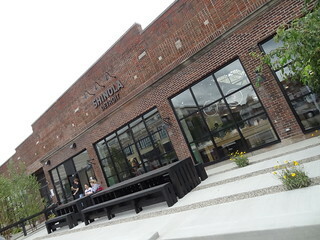 Kegs are shrink-wrapped to pallets and stacked high, bottles of beer are packed by hand into cardboard boxes, long communal tables made of planks are set off to the side. I love the names of the beer: Grand Circus IPA, Purple Gang Pilsner, Detroit Pale Ale, and the ever popular Dirty Blonde. Before we know it our glasses are empty, for a mere dollar you can take the glass home. 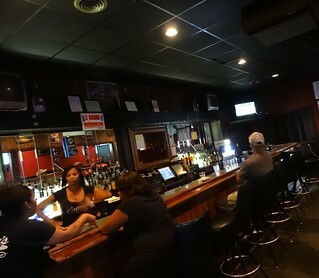 If you are looking for an out-of-the way spot to chill and you like beer, visit the Atwater Tap Room. 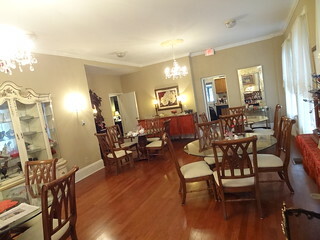 It is our last day in Columbus, we have spent the last two nights at the Short North Bed & Breakfast. 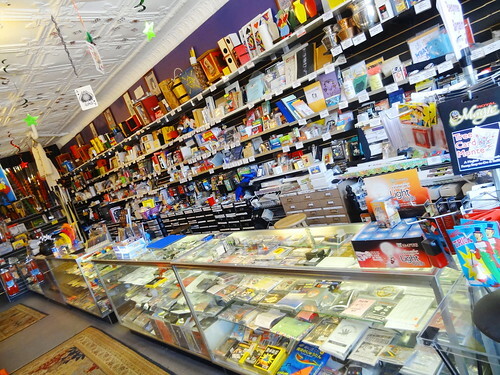 Located in the trendy Short North district, this large Victorian home is in the midst of a thriving neighborhood; homes are red brick and date back to the early 20th century, High Street is home to galleries, specialty boutiques and tons of restaurants. I finish packing as the tantalizing scent of bacon climbs the staircase, in the breakfast room Trelene has prepared a feast! Glass bowls hold chunks of fresh fruit on an antique buffet, fresh brewed coffee is calling my name, morning sunlight floods the room and sparkles off the crystal chandeliers. Trelene arrives with plates of scrambled eggs, crispy bacon and buttered English muffins, there’s a homemade salsa on the table, it has just the right amount of spice and heat and tastes delicious on my eggs. When we are finished Kris loads the car, I thank our hostess and bid her farewell. 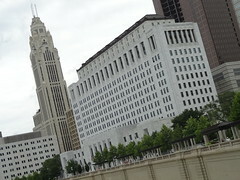 Columbus never stands still, as often as we get here there is always something new to see. 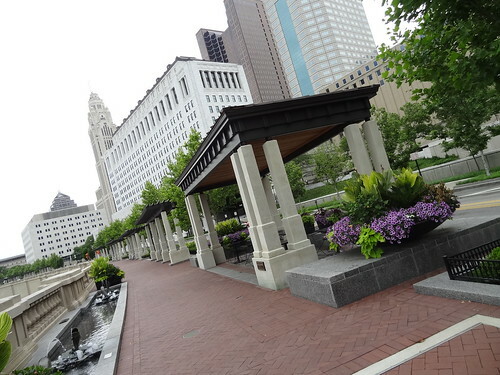 The city resides along the banks of the Scioto River and has been hard at work reconnecting downtown to the riverfront; the result is called the Scioto Mile. There are 145 acres of parkland stretching from the Arena District to the Whittier Peninsula; bikeways, pedestrian paths and boulevards make this area extremely people friendly. The Promenade leads us along the river, pavers make up the walkways, the 1920’s limestone floodwall was restored to its original Beaux Arts splendor, cafe tabletops are complete with inlaid chess/checkerboards. 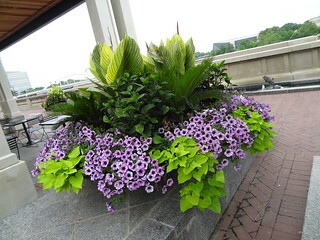 A stone colonnade lines Civic Center Drive, this morning the swings are all occupied, huge stone planter boxes are overflowing with hot pink Hibiscus, orange Canna’s, purple Petunias and trailing vines. Every so many feet we encounter low fountains; a marble pedestal supports a lovely arrangement of bronze leaves, in the center, clusters of fish spout water from their mouths, the sound of trickling water, soothing. 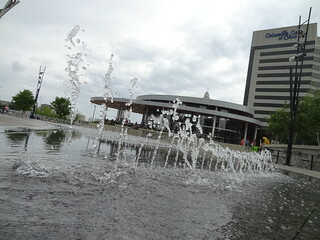 Our walk continues to Bicentennial Park; home to the fabulous looking restaurant Milestone 229, rose gardens, climbing wall and an amphitheater, the main attraction is definitely the Scioto Mile Fountain. 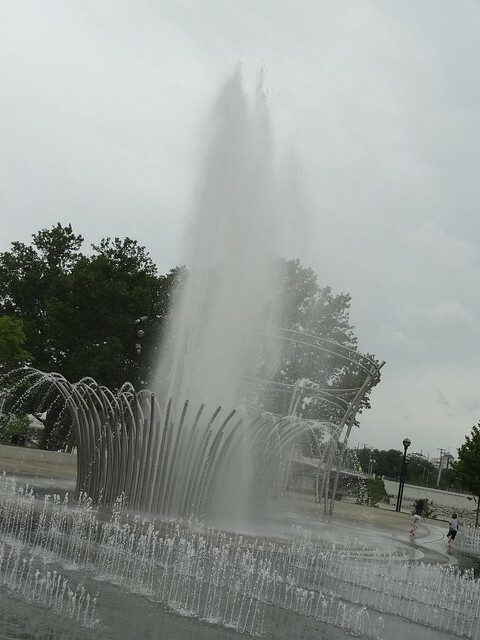 As human beings, I think we are naturally drawn to water, fountains are often centerpieces, gathering spots in urban areas, this is definitely true of the Scioto Mile Fountain. This 200 ft long, 15,000 sq ft patio-splash park-public art piece-interactive fountain is the place to be. As we approach, the main source of water is coming from a stainless steel circular blossom; jets of water shoot skyward from the center, a smaller volume of water flows from the outer ring. Gradually ground level spray nozzles come to life, as does the sound of laughter, five tall stainless steel halo structures begin to throw mist from the top ring, water begins to accumulate under our feet. We watch as young and old try to figure out the sequence of the jets, passersby pause to take in the scene, diners at Milestone 229 have a perfect view. We walk to the end of the park, actually stop and smell the roses, then it’s back to the car. 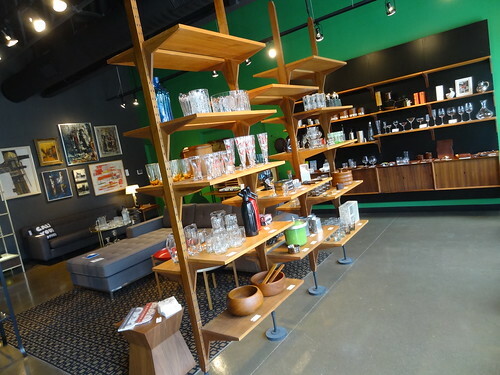 Columbus is home to some of the best vintage stores we’ve ever come across; it’s a big part of what keeps bringing us back. 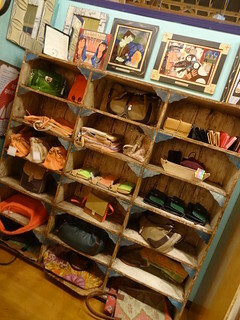 Years ago we discovered one of the best stores ever in Cleveland called Flower Child; a couple of years ago they opened a second location here in Columbus, c’mon, let’s have a look! 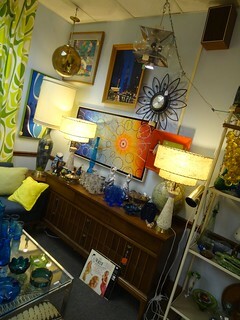 The moment I step inside I smile, this place has everything from vintage jewelry and lava lamps to art glass and tiki bars. 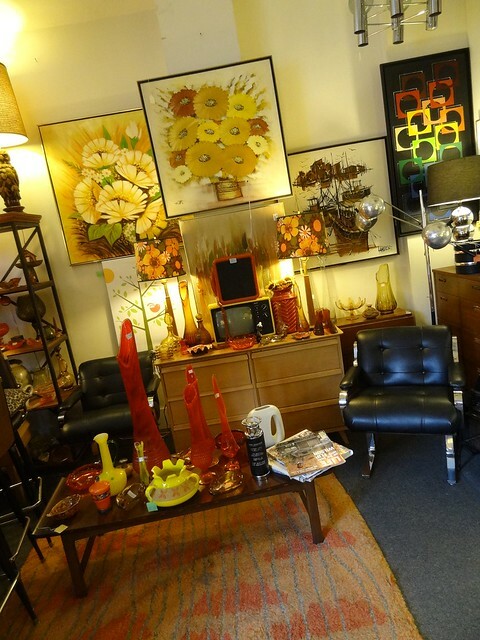 Unlike the average antique shop, here you find the colorful, zany, Mod and sometimes wacky items from the 1950’s through the 1970’s. 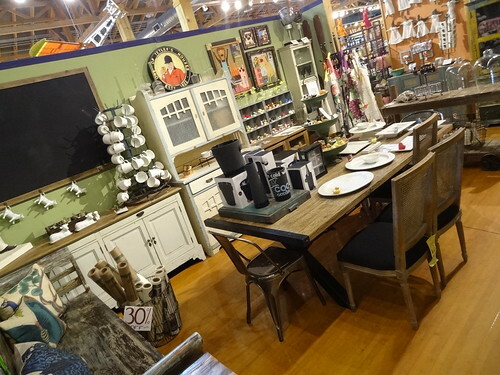 They do a fantastic job with their displays; instead of the usual shop where one large space is divided into dozens of small dealer spaces, they arrange it as a furniture or department store would; complete living rooms, dining rooms and bar sets, everything you need to complete your room organized into one setting. 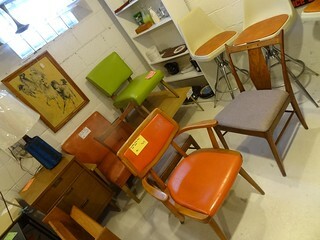 The selection of pieces is outstanding, they even make gold, avocado green and orange look tasteful and fun! 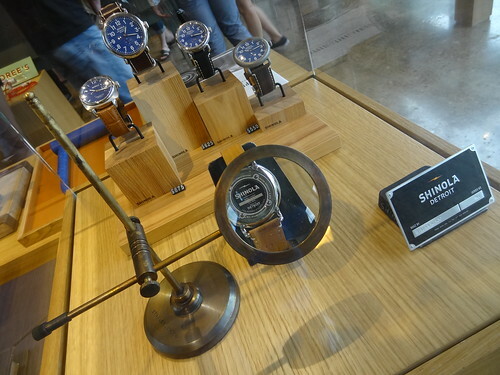 I haven’t seen a grouping yet that I wouldn’t take home…. Kris and I love the chrome and lucite table and chairs, the bamboo patio set complete with a bar and cocktail glasses is cool too, the colored glass is striking, look at all the hanging lamps! 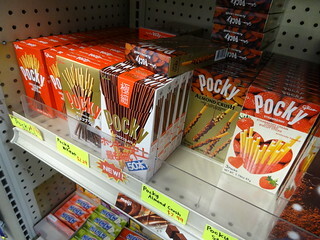 Having grown up around much of the stuff seen here, our affection runs deep. Once we have finished looking around both floors we decide to grab some lunch. Conveniently, we walk across High Street for our afternoon meal at Zen Cha Tea Salon, another of our regular stops when in Columbus. Inside, the space feels tranquil, tables and floors are pale wood, a flat screen TV on the back wall projects soothing images of nature. As we sit and unwind we sip our Spring iced tea, a wonderful combination of sweetened green tea, strawberries and blueberries, so good. 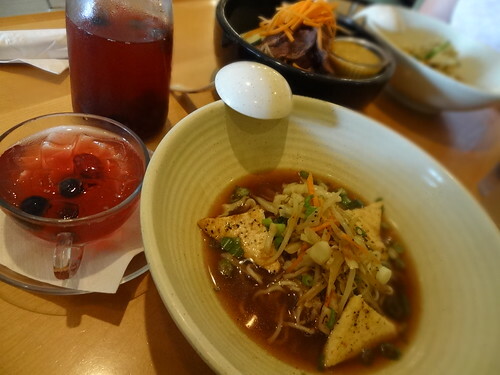 Our meal arrives, today we are having the Miso Ramen soup with tofu, very flavorful, and the Ginger Beef Salad. Thinly sliced medium rare beef lies atop crunchy greens, drizzled with a tangy ginger dressing-delicious! Now that our stomachs are pacified, it is time to start heading north. 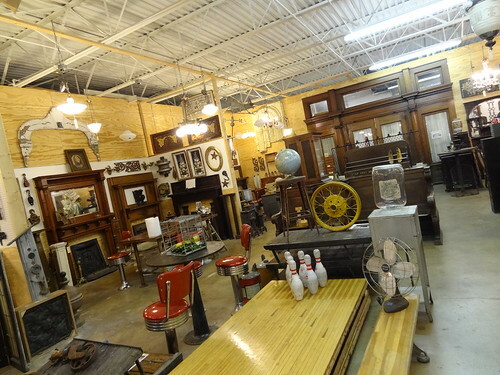 As we head out of the city we make a stop at Columbus Architectural Salvage on Clara St. The 10,000 sq ft warehouse houses both interior and exterior pieces salvaged from homes and buildings that were to be torn down. When I see such magnificent pieces such as fireplace surrounds, mirrors, doors and amazing light fixtures, I can only imagine what the buildings they came out of must have been like; I am sad to see such fine examples of architecture disappear, but glad that the materials are being reused and recycled. 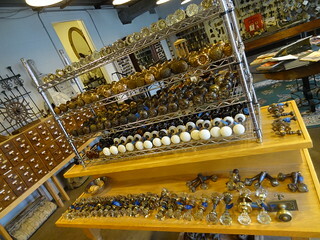 Everything is very well organized, you can buy antique doorknobs made from glass, porcelain or brass, hardware is neatly contained in a series of drawers. 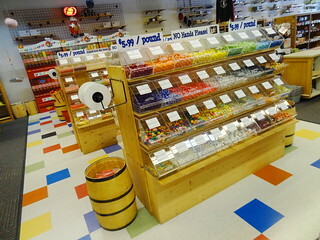 A complete bowling lane rests on the floor, peg boards hold a variety of tools and accessories. 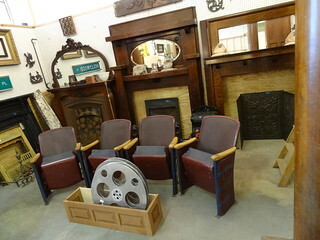 Vintage bathroom sinks in pink, mint green and white rest on pedestals, a box of large film reels sits near a group of old theater seats, street signs and concrete urns await a new purpose. 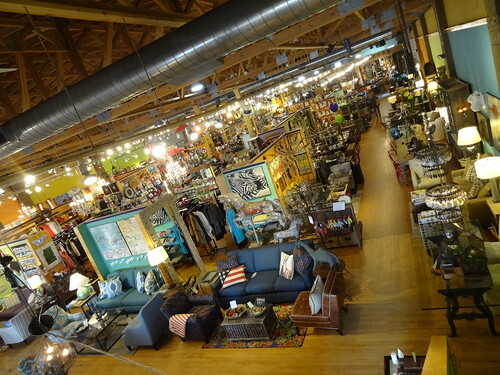 We continue up High Street into Clintonville, this neighborhood has a few more vintage stores we want to check out; first on our list is the Eclectiques Antique Mall. 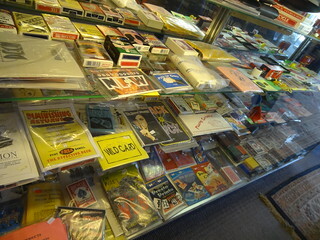 The building itself is 8,000 sq ft and has 37 dealers, from jewelry to postcards, you never know what you may find here. We get lucky and find a piece we have been looking for, one of those fake electric log sets that light up when plugged in, perfect for our 60’s free-standing fireplace. 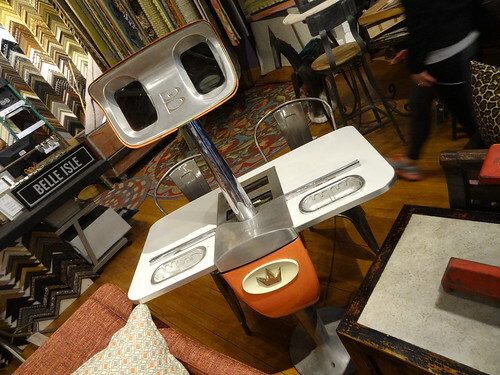 The basement is our favorite, this is where most of the mid-century furniture is found; bar stools with chrome legs, kidney-shaped coffee tables and chairs upholstered in frisee, it’s all so cool! We pay for our purchase, put the log in the trunk, then walk next door. 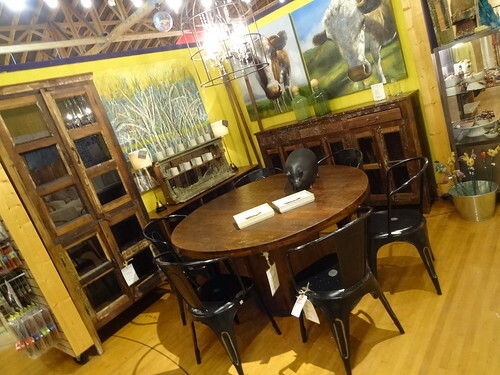 Euro Classics Antiques is not your average antique shop, the 4,000 sq ft showroom displays gorgeous oak furniture from the 1820’s to the 1920’s, specializing in Arts and Crafts furnishings. 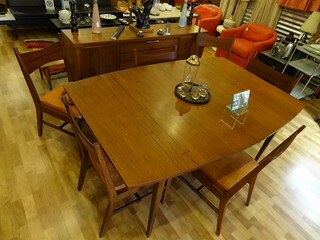 The wood is stained dark, bookshelves are fitted with leaded glass doors, tables and chairs are stylish and sturdy. 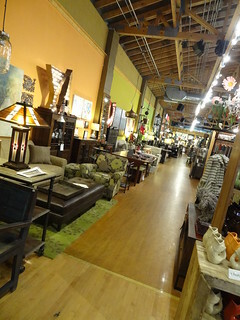 Down the stairs, the lower level has pieces from as late as the 1960’s, Kris is tempted by a bedroom set, unfortunately our SRT-4 is not the type vehicle one would haul furniture in…..The Boomerang Room is right across the street, as the name implies, the store concentrates on fabulous mid-century items. 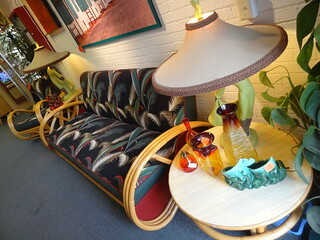 Gorgeous pieces from Broyhill, Lane, Knoll, McCobb and Herman Miller fill the shop. 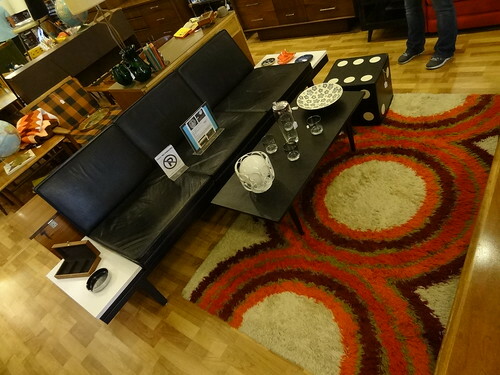 Shag throw rugs cover the floor, I see that the darker wood of the late 60’s and 70’s is now in vogue. 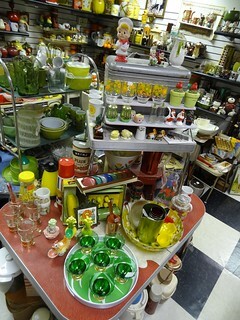 I see sets of cocktail shakers, oversize lamps, modern art sculptures, and vases; I wish I could take all of it home! 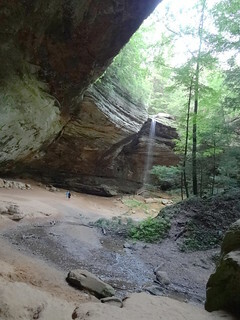 Speaking of home….Our visit to Columbus has been wonderful, now we are buckled in, on our way back to the D.
Today we are making our escape; we are trading in stop lights, strip malls and traffic for the peace and tranquility of nature, our destination, Hocking Hills. 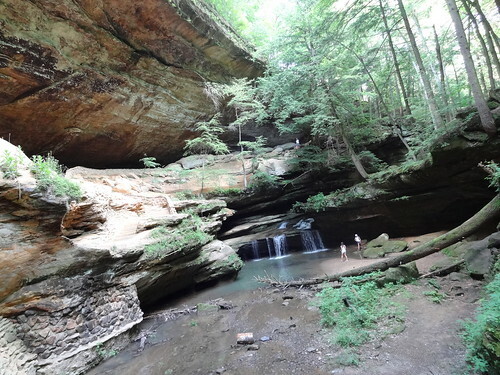 Located about an hour southeast of Columbus Ohio, we are taking the most direct route, there will be plenty of scenic roads to travel once we reach Hocking County. 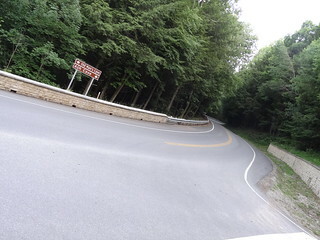 Just outside of Columbus we grab a quick lunch, we head south on 33, at the town of Rockbridge we make our right onto SR374, now the fun begins! 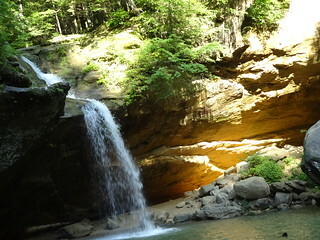 Located in the foothills of the Appalachian Mountains, Hocking Hills includes 9000 acres of State Forest land. 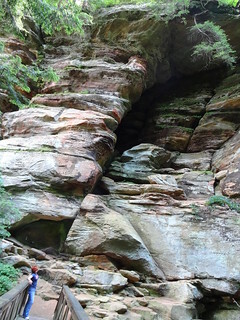 We will spend the next several hours on roads that twist and turn, rise and fall, we’ll view sandstone cliffs, hiking trails, recess caves, deep gorges and waterfalls, yes, this is Ohio. 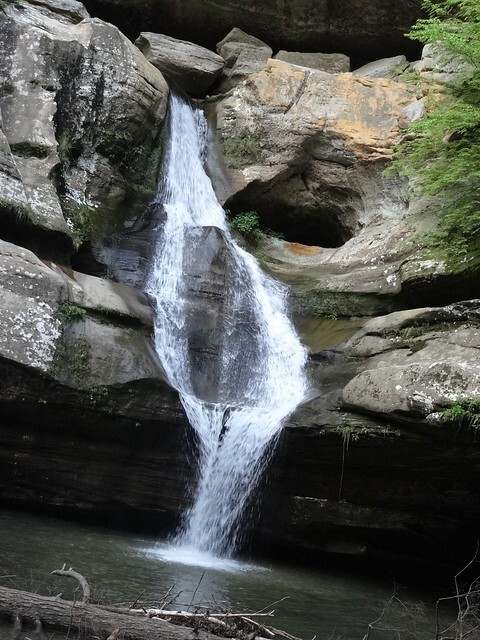 Our first stop is Cantwell Cliffs, this gigantic horseshoe cliff features a 150 ft sheer drop to the valley floor, centuries of erosion have created deep valley’s, steep cliffs and an incredible rock shelter. 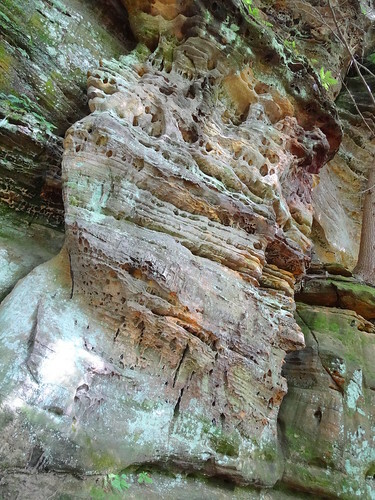 Here the sandstone varies in color from a pale terracotta to a dark reddish-brown, there are patches of turquoise and white. 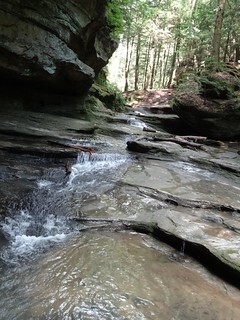 We hike the trail that leads us into the shelter itself, surfaces are damp and slippery. 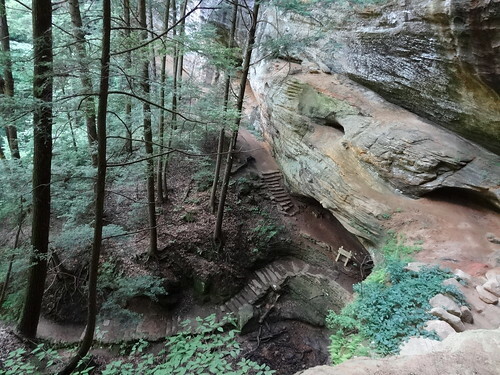 A system of pathways has been created throughout the area, steps are carved into the rock itself, at times man has had to intervene with concrete or wood. It is Friday, so there are few visitors, we have the area to ourselves, we relish the tranquility. We look around in awe, a photo cannot do justice to all that we see, but Kris will do his best to capture the beauty. 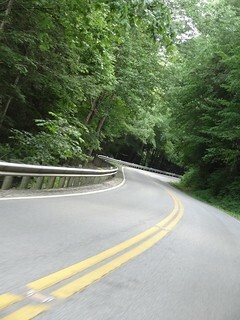 We are back on SR374, the road snakes through picturesque countryside, we follow the signs to Rock House. Each feature includes its own parking lot, signs make it easy to travel from one destination to the next. 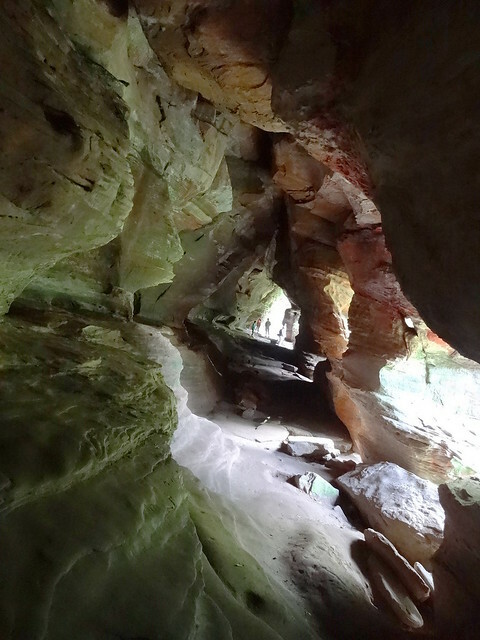 Situated midway up a 150 ft cliff of blackhand sandstone Rock House is the only true cave in the park. We begin our trek by descending a long rock stairway, the surrounding area lush and jungly, we encounter other hikers, this is a popular site. We watch the others and follow their lead to the entrance of the cave; hollowed out by water, the main corridor is 200 ft long, some points are 20 to 30 ft wide. It is a difficult contrast at first, going from bright sunshine to near darkness, I hear a bat fly overhead, doves are roosting nearby. As our eyes adjust we are able to explore the area freely, it is amazing! The floor is worn smooth, probably from centuries of human feet crossing the surface, walls are multi-hued and rough with cubby hole like spaces. I turn my back against the wall and look out what resembles a Gothic arched window, there are actually 7 of them separated by great sandstone columns. Kris follows the length of the corridor to a rock that juts out from the cave, he stands near the edge taking in the view; the ground below is dense with trees and vegetation, the sky a perfect powder blue. 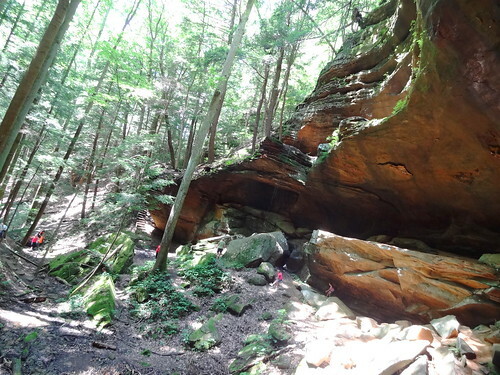 We zig and zag on SR374 until we reach Conkle’s Hollow, we follow the trail through this rugged rocky gorge said to be one of the deepest in Ohio. Everything here is so green! The valley floor is rich with Hemlock and Birch, ferns are prolific, I almost feel as if I have stumbled into some prehistoric land. 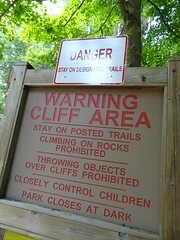 The ravine is a half mile long, vertical cliffs rise skyward, it is tranquil and peaceful. 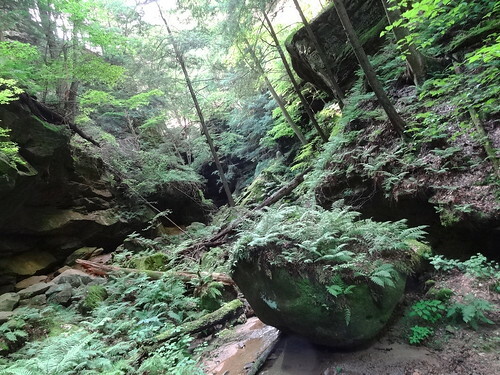 There is a true sense of wilderness throughout the Hocking Hills area, we meander the roads rarely seeing another car, stop signs are few and far between. 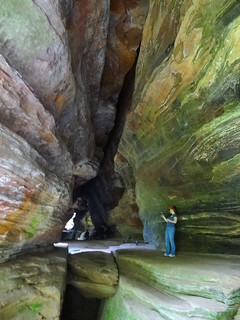 We arrive at Old Man’s Cave, probably the most popular attraction, a number of cars fill the parking lot. 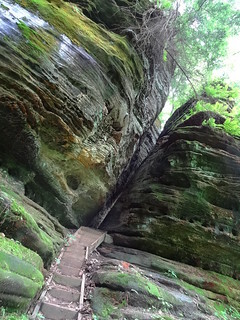 We amble along the trail, rocks play host to patches of moss in a variety of shades, tree roots hug layers of blackhand sandstone. Water cascades gently over worn stone to a swirling pool below, small concrete platforms look as if they are floating and act as steps to a bridge. 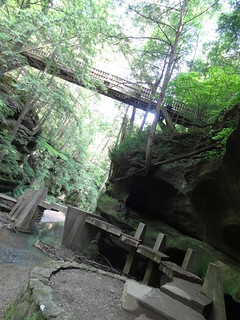 We follow trails and overpasses straddling the creek, bridges span three levels of falls. Areas of rock appear as if they have been submerged for centuries, holes are worn through; formations remind me of underwater castles. We ascend the stairway to the cave itself, a wall made of individual rocks hugs the right side of the stairs; the site is popular for picture-taking. The trail leads us up, down and all around, when we come to the end we decide to find a place to have dinner. 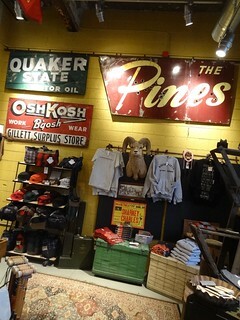 Here and there we have passed old-fashioned general stores, camp grounds and tiny villages. We are driving in the direction of the next attraction when we see a quaint little store, folks linger on the front porch drinking cold bottles of water, our thirst beckons us to stop. I wait in the car as Kris runs in for water, we are parked facing what appears to be a tiny log cabin, to the left of the screen door a sign simply reads “restaurant”. 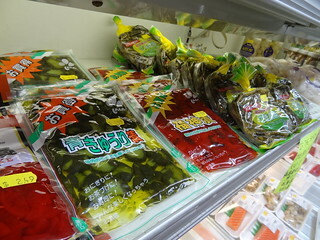 Kris returns with 2 bottles of ice-cold water and asks if I’m hungry, a question that rarely needs to be asked; the cashier recommended he check out the adjacent restaurant, so he does. When he returns to the car he says “we’re eating here”, so I grab my purse and follow him inside. 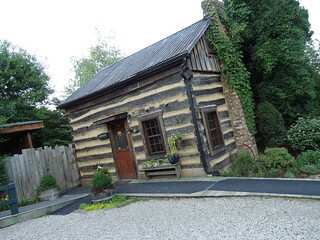 This is the restaurant at the Inn at Cedar Falls, housed in two log cabins built in the 1840’s words like quaint, charming and rustic come to mind, I mean, the place is fantastic! In a million years I never would have expected to find such a place out in the middle of nowhere. We arrive at the perfect time, there is a table available out on the patio, luck is definitely on our side. We have a seat under a large green umbrella, gardens behind us, the cabin to the front, whimsical planters are made from repurposed antiques. Mind you it is a hot June day, we left Detroit this morning and have been roaming through the wilds for the last several hours, we have to be quite a sight! Surrounding patrons are well dressed, their hair is combed, I am doubtful their shoes are caked with mud as ours are, still we greeted warmly by our waitress, nobody seems to mind that we are disheveled. 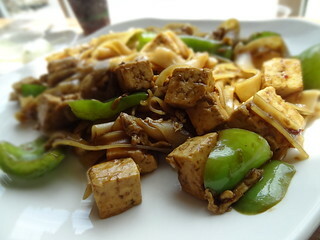 We order quickly, we are famished. 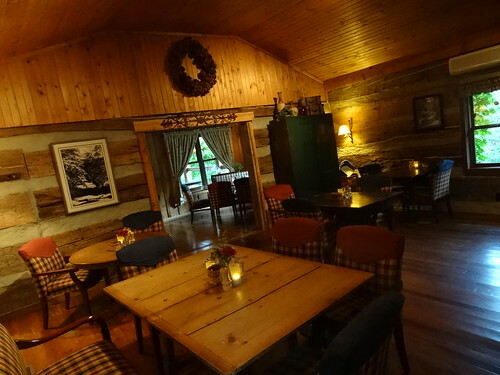 As we wait for our dinner we take a look inside the restaurant; the walls are the original log and concrete; knotty pine ceilings, hardwood floors make the tiny spaces cozy. 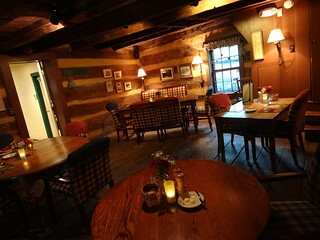 Plaid upholstery covers dining room chairs, photos of Hocking Hills in all four seasons adorn the walls, the food smells delicious. 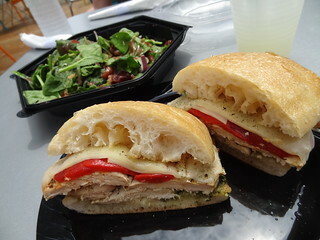 We are sharing the house salad of the day and the smoked mozzarella, red pepper ravioli, both are absolutely wonderful. 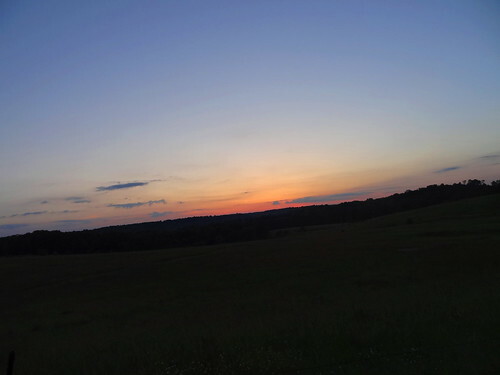 We finish our meal in record time, though we would love to linger, we have more to see before it gets dark. 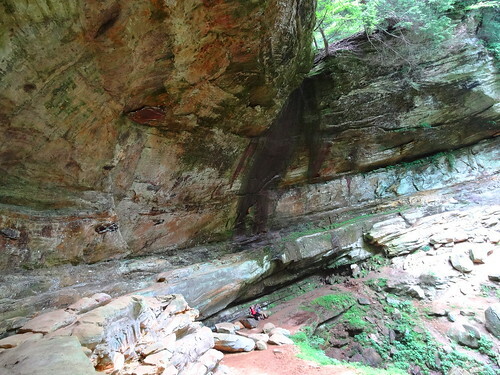 I read that Ash Cave is the largest recess cave in the state of Ohio, measuring 700 ft end to end and 100 ft deep from the rear cave wall to the front edge, that’s pretty impressive. We ramble along the paved path (worth noting, the path to Ash Cave is wheelchair accessible), narrow, steep gorge walls on each side of us. 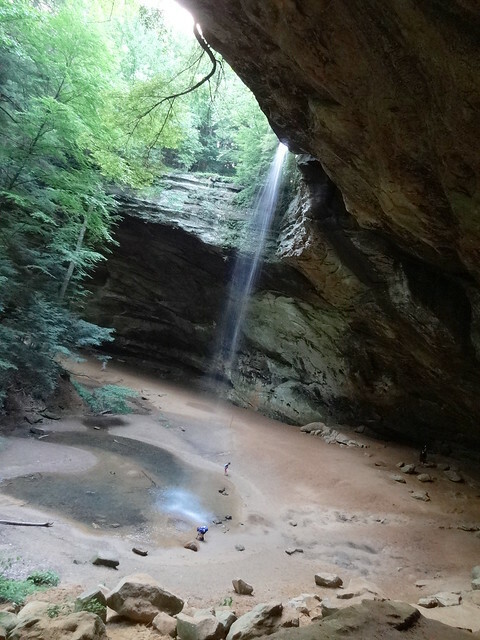 We follow along, rounding a bend the space opens up, a tributary of Queer Creek spills over the rim of the cave to a pool below, the sound soft and soothing. Hemlock and Beech trees are rampant, they are tall and spindly. 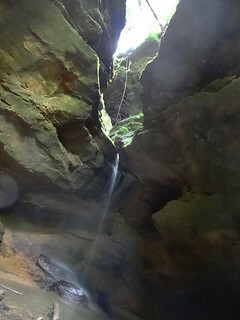 The cave is horseshoe-shaped, allowing tourists to duck behind the waterfall, there is no shortage of photo ops here. Dusk begins to fall just as we finish exploring, we are exhausted! 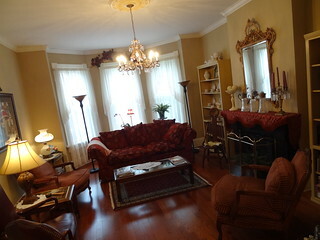 We take the quickest route to Columbus, we are staying at the Short North Bed and Breakfast. When we arrive we are greeted by Trelene, she shows us to our room and asks us what time we’d like breakfast. 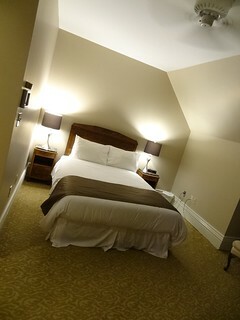 After we are situated we head back downstairs for a nice glass of wine to unwind from our active day. Time to get some sleep, we have a lot to do tomorrow! 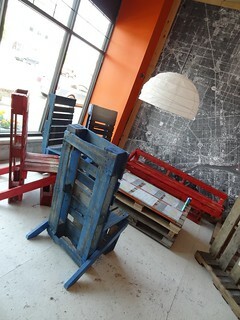 DETROIT: Old Skool Chillin’ …. There’s nothing like a Summer night in the city; the sun has set beyond the skyscrapers, the temperature has dropped only slightly, the concrete tightly grips the heat. 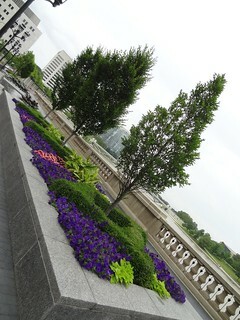 Out of nowhere a slight breeze ruffles the leaves of trees planted along the streets, it is a welcome gesture. The season is short, we are drawn outdoors to soak it up, we will remember it fondly come January. 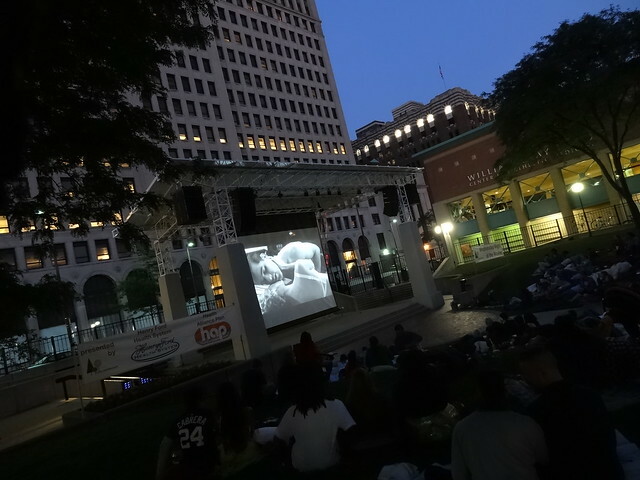 It is Wednesday evening, Movie Night at New Center Park, tonight we are seeing PSYCHO! We pass through the park gate and grab ourselves chairs, we scan the area and choose where to sit, dusk is falling. New Center Park opened as an outdoor concert, activity and concession venue on the corner of Second Ave and W Grand Blvd in 2010, it was an instant hit. 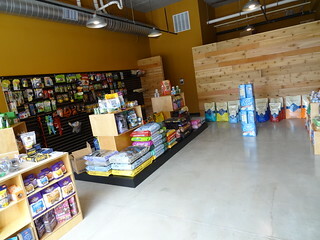 The indoor concession area offers a bar, restrooms and a small amount of seating. 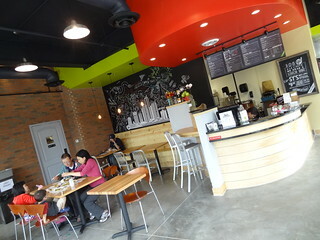 A patio off to the right offers menu choices such as popcorn, hot dogs, hamburgers and Better Made potato chips. 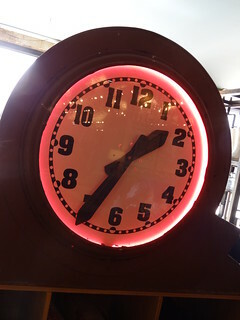 We are starving, I follow the scent of food and place my order at the outdoor cash register, in an instant both a veggie patty and a burger are placed on the sizzling grates of a grill. While I wait for the food Kris goes indoors for drinks, we arrive at an open table about the same time. 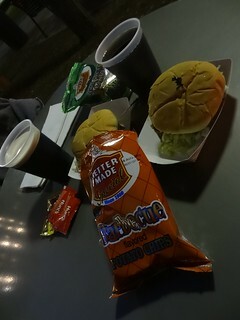 We dress our burgers with condiments and vegetables, we share bags of BBQ and Sour Cream & Chive chips; dinner under the stars. The movie begins just as we finish our meal, we take our seats in the orange folding chairs we had placed on the grass earlier. The sloping lawn has become dense with blankets and chairs, viewers are quiet, all eyes are glued to the big screen. It is 1960, Janet Leigh appears onscreen as Marion Crane, a mild-mannered secretary employed by a real estate company. Regarded as one of Hitchcock’s best films, he creates a great sense of tension and doom as Marion flees Phoenix with $40,000. 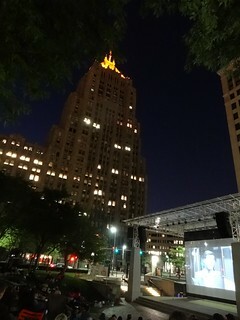 The Fisher Building’s Golden Tower is aglow, it watches over us as the infamous “shower scene” takes place, it’s even scarier on the big screen. 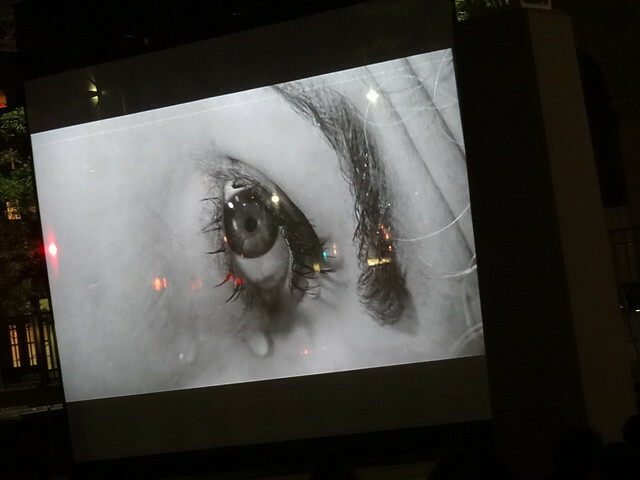 I had forgotten the iconic scene takes place so early in the movie, the close-ups are unnerving. 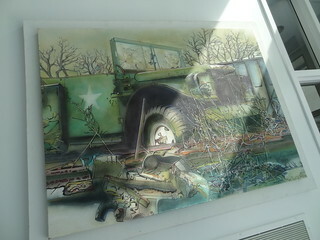 We anxiously follow the characters quest to solve the mystery of what happened to Marion, in the final scene Marion’s car is being pulled from the swamp. Janet Leigh won the Golden Globe that year for Best Supporting Actress. As the credits roll the crowd begins to disperse, we have only a short walk to our next destination. 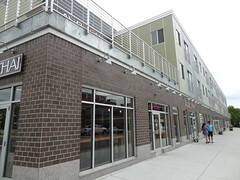 Northern Lights Lounge is just around the corner on Baltimore. Let’s just say it wouldn’t be surprising to find us here on a Wednesday night, NLL is one of our favorite spots to catch Jazz in the city. Home to live music every evening, each night features a different genre; tonight is Str8 Jazz No Chaser, don’t you just love Wednesday’s? 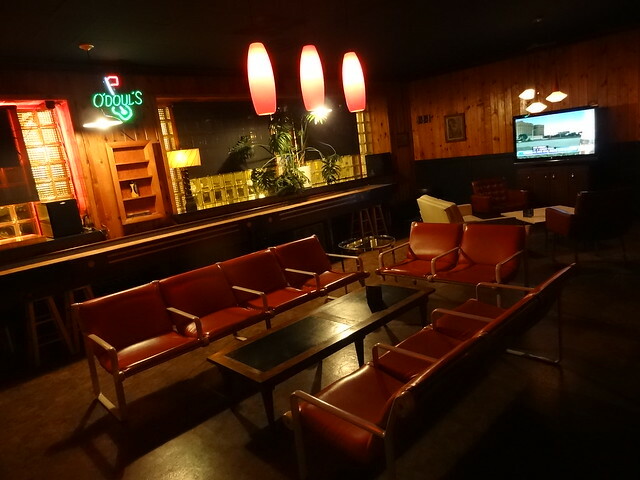 Inside, the bar is done up in funky light fixtures, groovy furniture, knotty pine paneling and glass block windows; it captures the hip, cool style of the 60’s, I think I just saw Joe Mannix walk by…. The music is in full swing, the stage, crowded with visiting musicians. 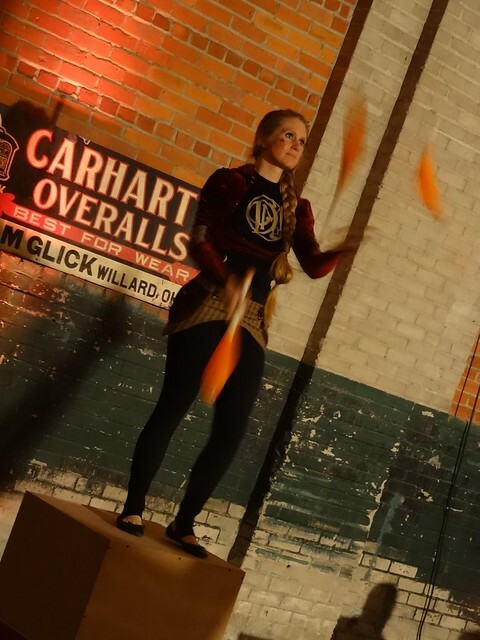 Plates filled with burgers, nachos, seasoned fries and their quasi-famous chicken strips fly by; several steps above your average bar fare, we often partake. 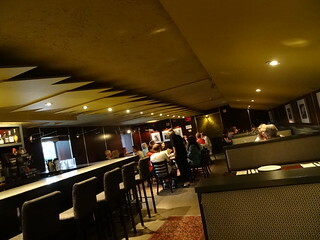 Finding an open table near the back, we order drinks, an apple martini and VO & diet will soon arrive. 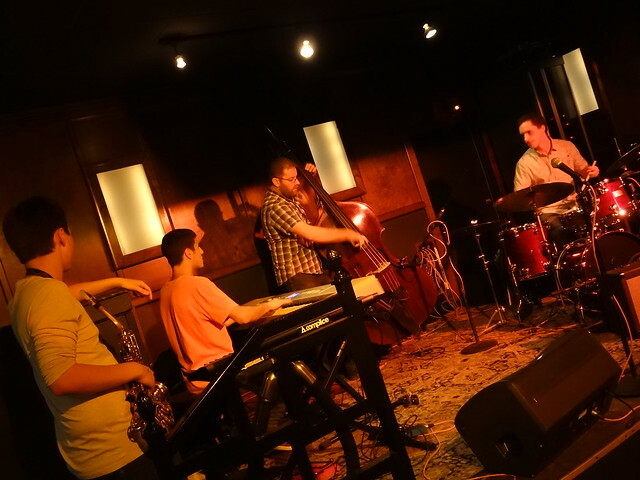 The Mike Jellick Trio consists of pianist Mike Jellick, bassist Miles Brown and Drummer Jesse Kramer, you can find them here each Wednesday beginning at 9pm. 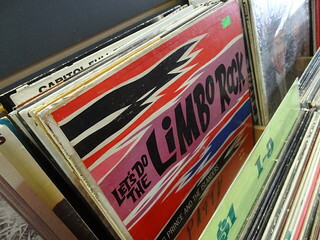 The group mainly plays great Jazz standards from days gone by. A song begins, it is easily recognizable, then we are taken on a musical joyride lasting a dozen or so minutes, ending up right back where we started. 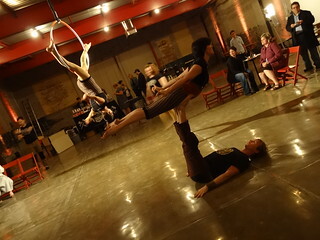 The musicians are extremely talented, their play looks natural, effortless. Tables near the stage are becoming crowded with hopeful musicians. 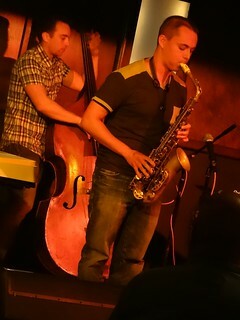 The trio play the first set exclusively, after that there is an open invitation for others to take the stage. Each session is unique, some nights the horns rule, it is not uncommon to see a flute or guitar added to the mix, on rare occasions we are treated to a vocalist. 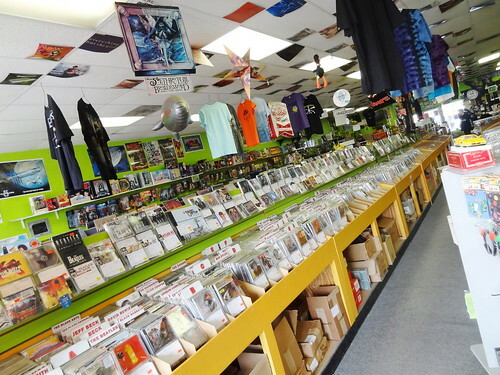 The music is always top-shelf, Detroit is home to a multitude of fabulous musicians. 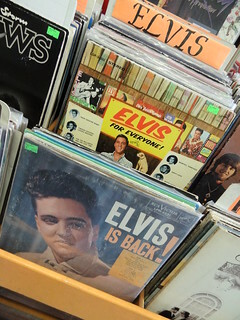 If you are a fan of old Motown tunes, be sure to stop in on a Tuesday evening, former Funk Brothers studio band member Dennis Coffey will astound you with his guitar-playing skills. Blues more your thing? Thursday is the night for you. 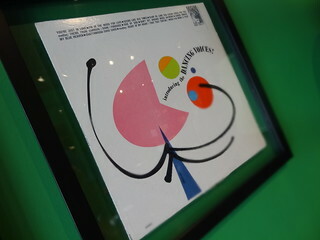 Great music, chill atmosphere, delicious food, what more could you want? 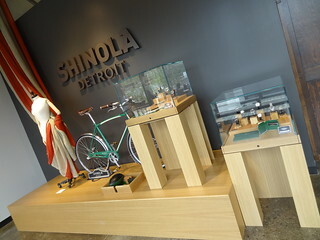 DETROIT: Things are Popping-Up all over…. 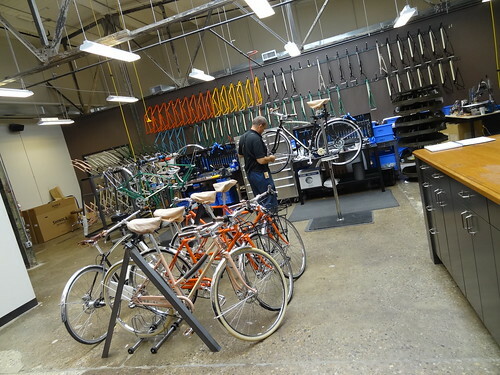 There’s a new way of doing business in Detroit. First take an old building that has been vacant for years, maybe even decades, add a group of budding entrepreneurs, a team of volunteer architects, mix well and place in a neighborhood hungry for economic revitalization, the result; a series of Pop-Up (temporary) retail spaces in the Jefferson East Business District (JEBA) affectionately nicknamed Jeff Chalmers. We have driven down this strip of Jefferson near the Grosse Pointe border for years, it is attractive and has remained intact. 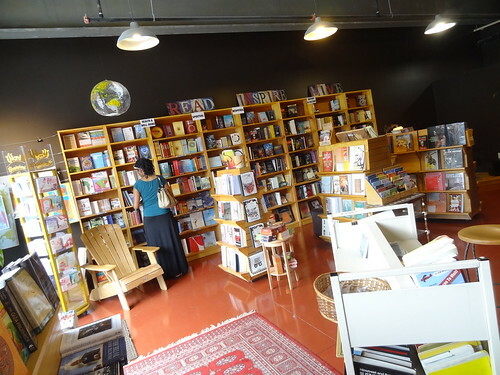 Today as we park our car we see that it is lively; there are sandwich boards on the sidewalk, an outdoor cafe, people milling about. 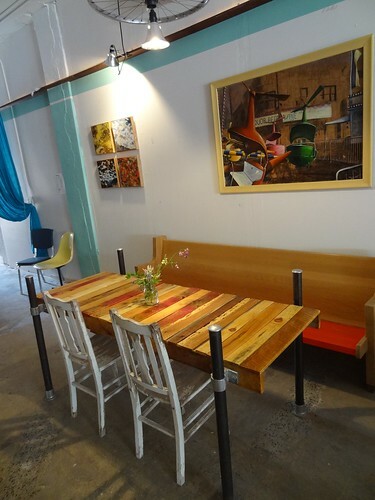 First we head into Coffee and (______), we are instantly charmed by the space; furniture is made from wooden pallets, a bicycle rim ads whimsy and light, paintings by local artists decorate the walls, bright-colored cushions and a turquoise wall make it feel light and summer-y. Pastry chef Angela is behind the counter pulling espresso shots and describing today’s baked goods (the “and”) to a customer. As the word brownie reaches my eardrum I know exactly what I’m going to order. 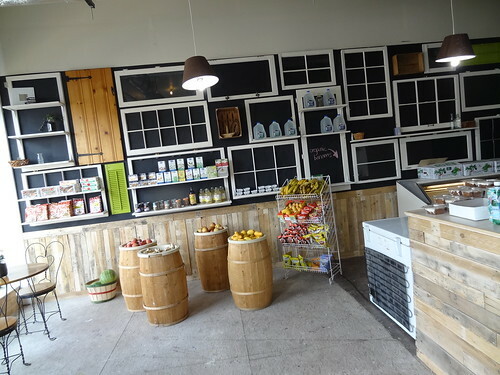 Angela did a stint back in the fall in West Village, her “Coffee and” shop was well received in the neighborhood, we are glad to see her at it again. Taking a seat at the counter we anxiously take a bite of the brownie; the edge is chewy, the center soft and gooey, a piece of chocolate heaven. 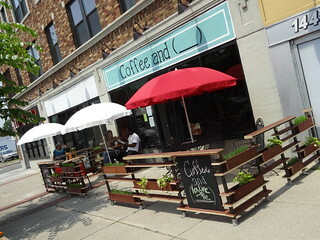 As we sip our iced coffee a steady stream of patrons come and go, many seem to know each other, all are excited at the prospect of a neighborhood coffee shop. We are greeted by a man named Ritchie, he’s the economic development director at JEBA, he tells us a bit about the Pop-ups and the area, his enthusiasm is contagious. 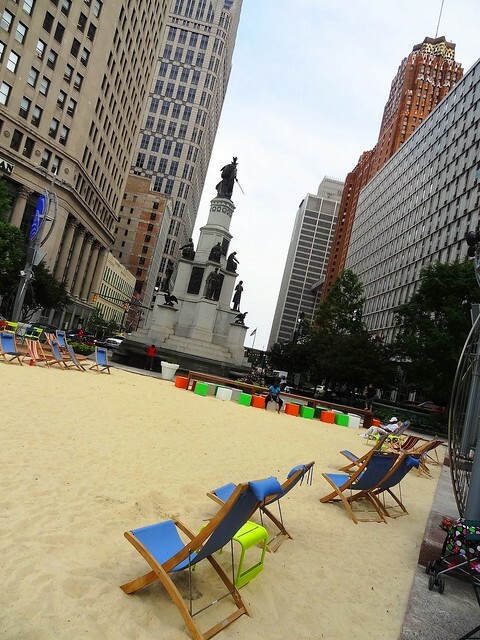 Have you heard there’s a beach in downtown Detroit? Seriously! 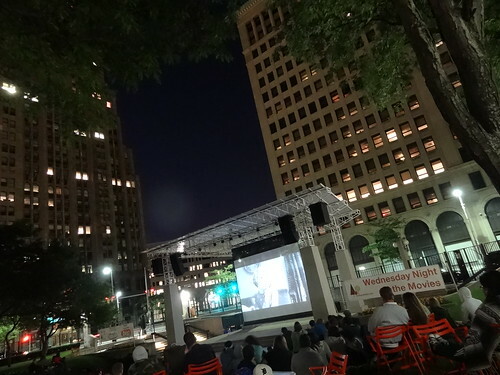 From now until the end of September Campus Martius Park is home to tons of white sand, beach chairs and a Beach Bar and Grill serving Frankenmuth beer and cocktails. Guess where we’re having lunch? 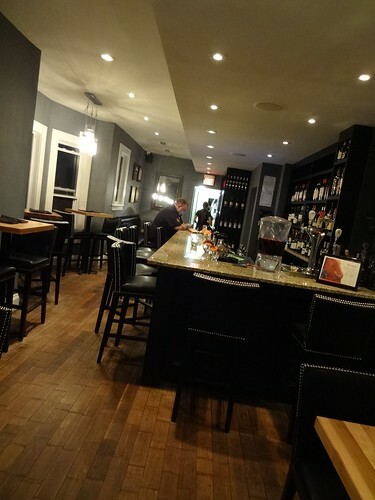 We place our order at the bar, the food portion is run by the folks at Fountain Bistro, we choose a table on the wooden deck that gives us a nice beach view. 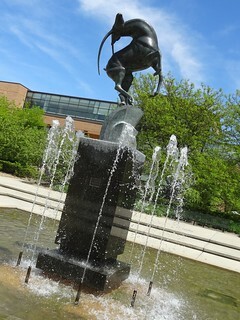 The area is fabulous; surrounded by skyscrapers, the fountain on one end, Soldiers and Sailors monument on the other, there’s nothing else like it. Tables in lime green, orange and turquoise are set up on the deck, area workers relax in beach chairs, shoes off, feet pushed into the soft sand. Small children play with pails and shovels, delighted at the feel of the grains in their fingers. Before we know it our lunch arrives; the Traverse City salad is outstanding with the homemade strawberry vinaigrette, the chicken pesto sandwich is large and flavorful. When we have polished off the food and fresh squeezed lemonade we cross over to Cadillac Square. 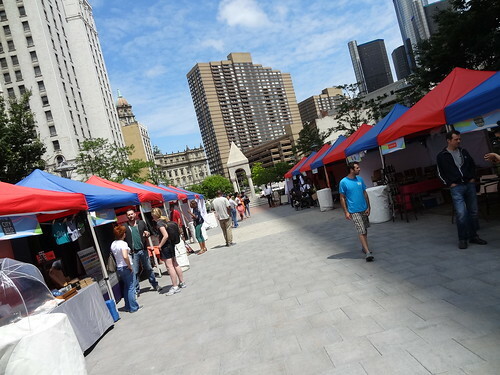 From now until August 23 Cadillac Square is hosting a summer time market. 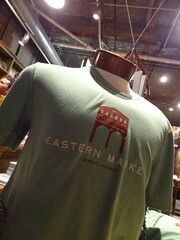 Monday through Friday from 10 am until 2 pm food vendors are set up in bright green mock storefronts. 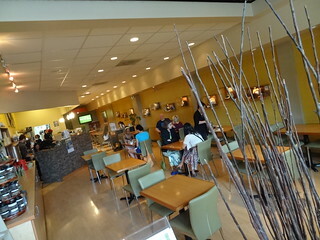 In addition to the food, visitors are treated to live music each day with Lunchtime Acoustics. It just so happens that today is the 4th Friday of the month, which means “The Market” is in full swing. 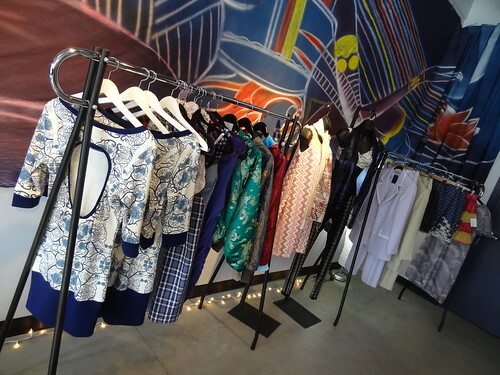 This area is reserved for artists, designers, vintage dealers, apparel, home goods and craft foods by independent retailers. 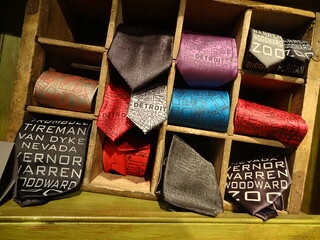 We wander from booth to booth; wallpaper, t-shirts, preserves and jewelry, all top quality products. 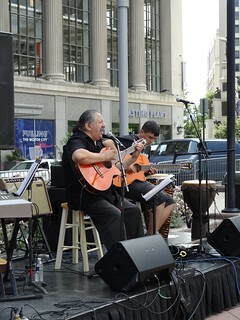 In the background a duo play guitars and sing in Latin American style, it is a lovely afternoon. 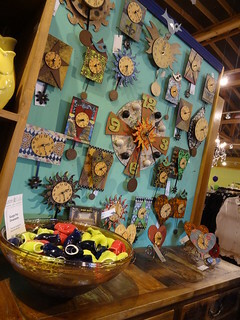 You have two more chances to visit the market: July 26 & 27 and August 23 & 24, open 11a-9p Friday, 11a-7p Saturday…….don’t miss it! 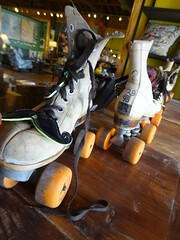 Did I mention that today is National Skateboard Day? 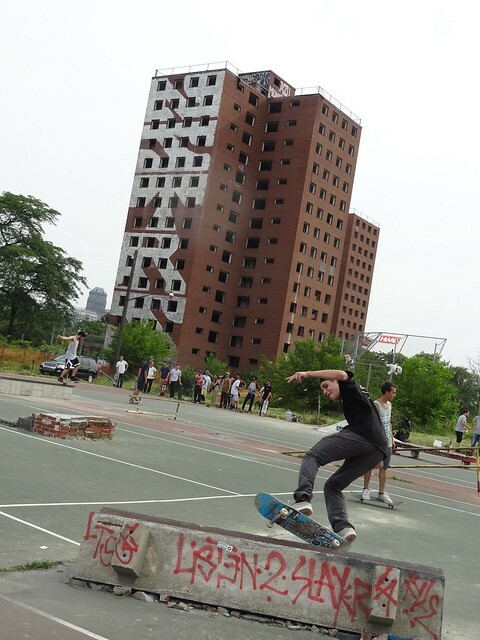 We had noticed groups of skateboarders making their way through the city all day long, then someone mentioned they were gathering near the old Brewster projects. Let’s see what they can do! We park along the side of the road near the 375 service drive, the long forgotten Brewster buildings stand windowless and empty, mother nature has reclaimed the surrounding land, abandoned tennis courts have been transformed into a make-shift skills course for skateboards. Dozens of young men take turns jumping piles of bricks, some slide across yellow railings, others maneuver their boards along concrete benches, it is easy to single out the best skaters. After a peaceful nights sleep at the Webster House the car is loaded and we are on our way, a quick stop at Populace for coffee and we are headed to Saginaw. At one time Saginaw was a thriving lumber town, the nearby forests were thick with White Pine, the proximity to the river made it easy to float logs down to the sawmills, they were then loaded onto ships and later railroad cars and sent all over the country. As lumber production began to disappear a new industry had taken hold of the area, manufacturing. 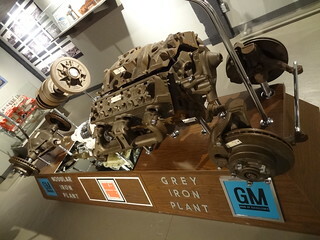 Most of us are unaware at what a manufacturing hub Saginaw was, at one point the city and township were home to 12 General Motors plants and an Eaton manufacturing plant; not to mention the production of chemicals, plate glass and metal fabrication. Saginaw’s contribution to the Allies eventual victory was significant; facilities here produced over half a million M1 Carbine rifles for the US military along with gun parts, tank treads and ball screws for the Boeing B-29’s, thanks to our manufacturing base we could build it all! Through the years plants were bought and sold, many closed down, only a few continue to operate today. Saginaw struggles with the same issues so many of our once great manufacturing cities do. 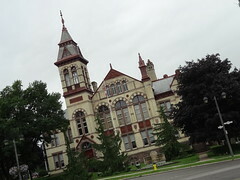 A trip down Jefferson Ave gives one a glimpse of Saginaw’s magnificent architecture. 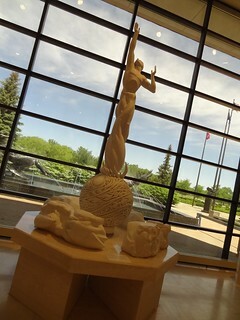 We begin our visit with a trip to the Marshall M Fredericks Sculpture Museum on the campus of Saginaw Valley State University, I bet you even know some of his work. 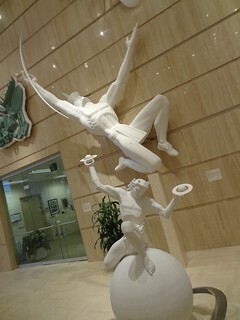 Spirit of Detroit statue? 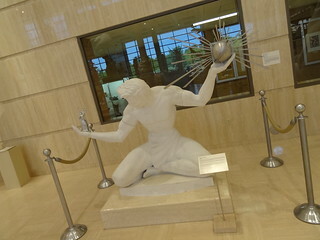 Yep, that’s his, Christ On The Cross out in Indian River MI, that too, how about the Leaping Gazelle, aka the Levi L Barbour Memorial Fountain on Belle Isle? 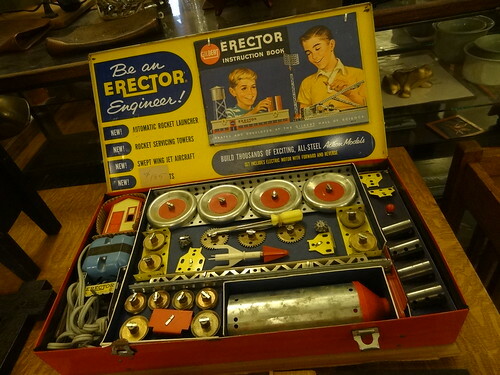 Uh huh, as a matter of fact, that was his very first commission. Fredericks grew up in Cleveland, graduated from the Cleveland School of Art in 1930, he traveled to Sweden to study under another great sculptor, Carl Milles (who had previously studied under Rodin in Paris). 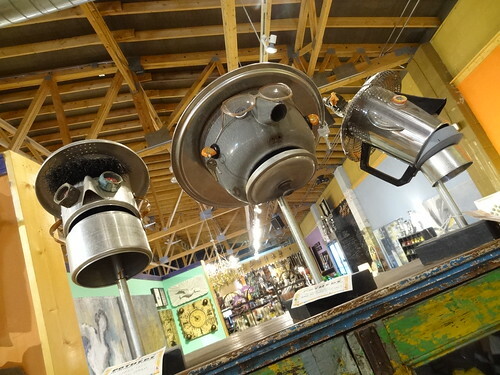 After Fredericks spent some time in Europe, he was invited by Milles to join him on staff at the Cranbrook Academy of Art in Bloomfield Hills, which he did, Fredericks resided in Birmingham MI until his death in 1998. 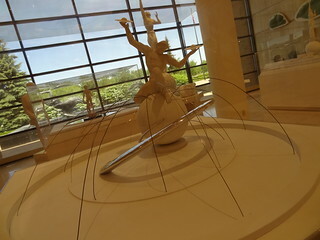 We arrive at the museum, Fredericks sculptures are scattered about the landscape, Kris recognizes the Lion and the Mouse from his childhood days at Eastland Mall. 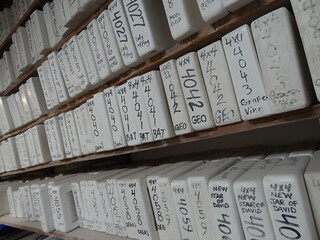 Inside, a large space is tightly filled with plaster castings for Fredericks pieces, we are familiar with many of them. 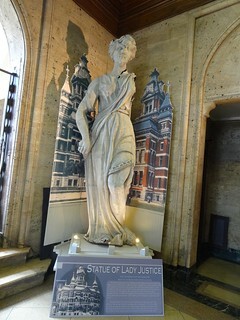 Starting at one side we take our time traversing the aisles; there are a couple of castings for The Spirit Of Detroit in different sizes, it was not unusual for Fredericks to make smaller versions of sculptures as sort of practice pieces. 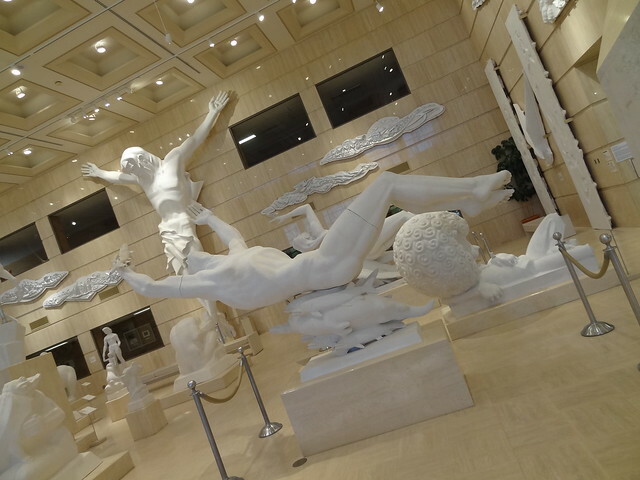 A down-sized version of Christ on the Cross hangs on the marble wall, the Leaping Gazelle was one of his most reproduced pieces, it is lovely even in plaster. 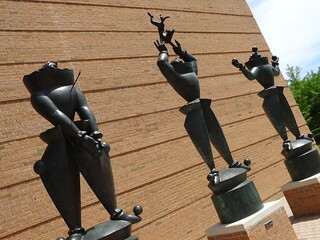 A row of elongated figures balance on round bases, they must belong to a fountain. 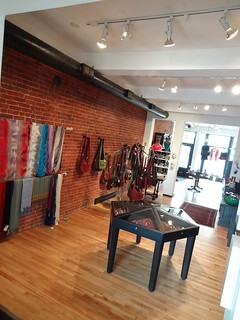 The left wall is windows top to bottom overlooking a pretty green space, water splashes from one of Fredericks fountains. 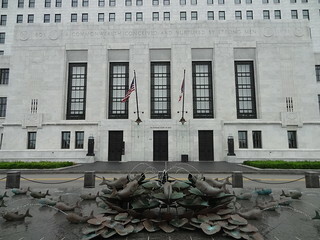 Figures are often reaching upwards towards a higher power, animals always look friendly, we recognize the Cleveland War Memorial Fountain. 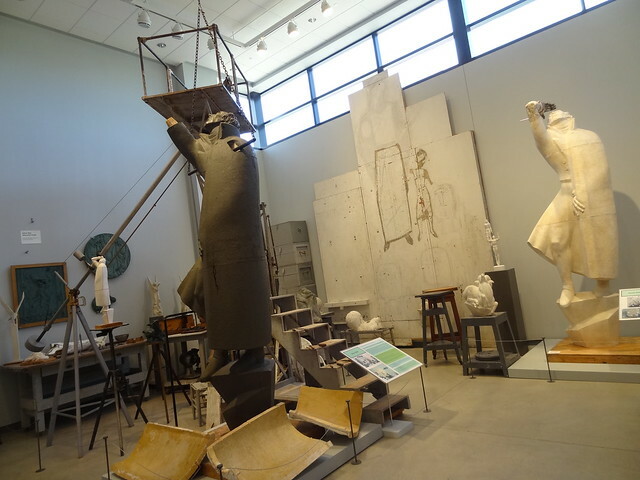 The next room over is a reproduction of Fredericks sculpture studio, everything in there; tools, equipment, armatures, came from his studios in Royal Oak and Birmingham. All the steps are laid out from sketch to casting, we watch a video showing the process, it really is amazing. 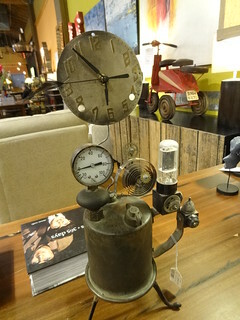 The gallery displays 200 works of bronze and plaster molds that span Marshall Fredericks career, we both love his work! 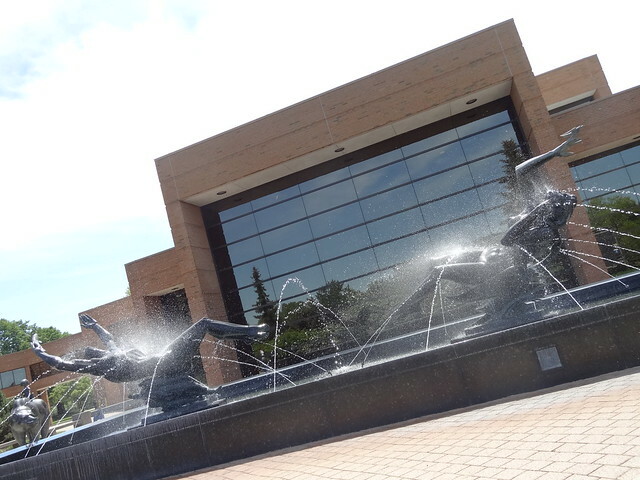 As we depart the museum we see the Night and Day Fountain, the same one sits outside the McMorran auditorium in Port Huron, we check out the remaining outdoor sculpture and then we are off to downtown Saginaw. 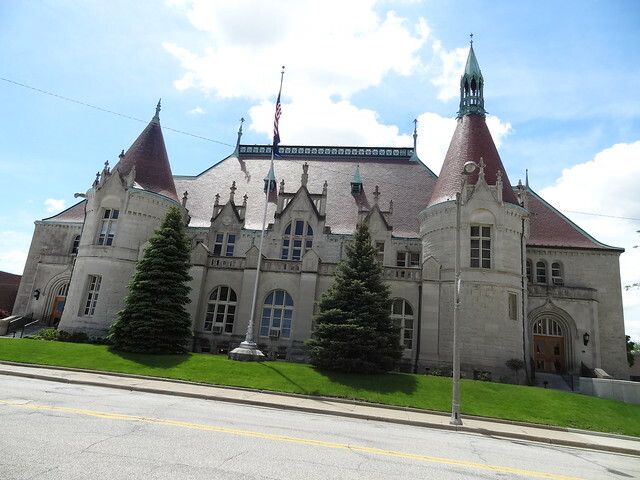 As I mentioned earlier, Saginaw has some incredible architecture, one such building is the Castle Museum. Designed by William Martin Aiken it was built in 1898 as a United States Post Office, which means, no expense was spared. Completed in the French Renaissance Revival style, this place is stunning. Saginaw’s population continued to grow, in 1937 the building was enlarged, thirty years later the building was threatened with demolition, fortunately it was transferred to the County of Saginaw and became the Castle Museum of Saginaw County History. Covering all aspects of local history they have over 100,000 objects and artifacts related to the heritage of the area, they did a fantastic job making the museum interesting to everyone, not just locals. 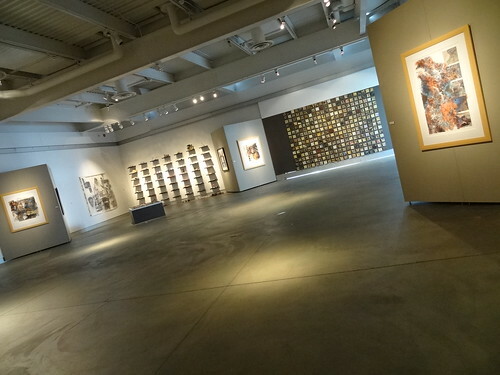 The interior space is perfect for a museum; wide hallways, large rooms, lots of windows, the structure itself is just as interesting as the exhibits. 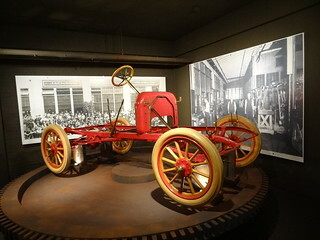 Automobiles from different eras are displayed in the main hallway, we see architectural pieces from old buildings, photos showing the interior when it was a post office hang on the walls. We climb the circular stairway to the top floor a gold medallion decorates the center of the ceiling. Exhibits take us from the early days when Indians roamed the land to the time of lumbering, noting that in 1880 Saginaw Valley was home to 80 sawmills. My favorite section is the re-creation of Saginaw in its prime; a vegetable truck sits near the City Market, you can pretend you are taking a ride on a street car downtown. 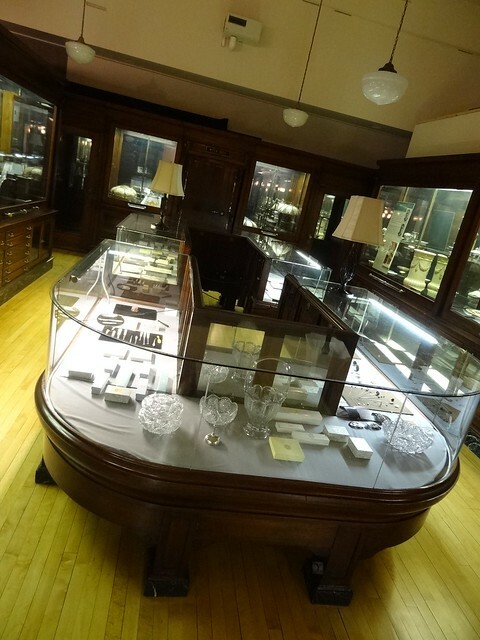 When Myer Bros. Jewelers closed in 1974 the museum obtained all of the interior counters, cabinets and mirrors, I actually feel like I am in the store, it’s beautiful! 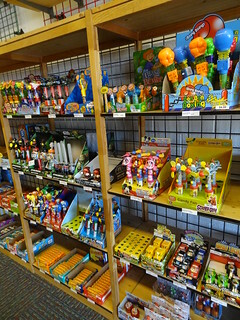 Other local shops are represented as well including Morely Bros. Hardware. Back in the days when the building was a post office people actually paid their bills by sending cash in the mail….In one area we see the old safe, signs direct us up a narrow stairway, leading to an even narrower hall, from here we see tiny elongated windows that were used to ‘spy’ on employees as they were processing the mail, the government wanted to make sure all that cash got to its intended destination. 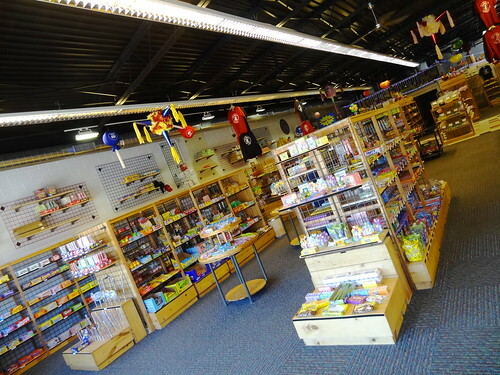 The lower level is home to a large “HO” Scale operating railroad with more than 1000 feet of track, two freight-yards and realistic vintage scenery. Maintained and operated by the Saginaw Area Module Modelers it’s really cool. We walk the perimeter of the large display, there is so much to take in, trains are running in several different directions, volunteers are happy to explain all that we are seeing. 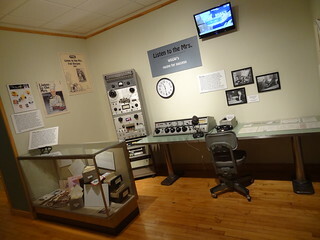 Throughout the museum we see much of Saginaw’s history from furniture, photos and clothing to vehicles, toys and household goods, it has been an enjoyable visit. As we exit the museum our gaze falls upon another gorgeous building right behind it, this would be the Hoyt Public Library. Although Jesse Hoyt was never a permanent resident of Saginaw he and his family owned a substantial portion of the city and were involved financially in lumber, railroads, salt and buildings. Always concerned for the welfare of the community, he willed the city $100,000 for the establishment of a public library to be built on a parcel of land owned by him. 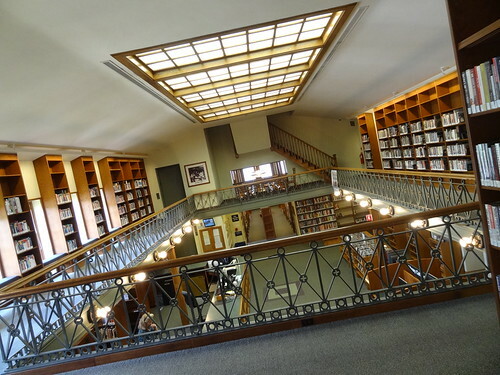 The library was to be for consultation and reference only and to always bear the name Hoyt Public Library, completed in Romanesque design the library opened in 1890. 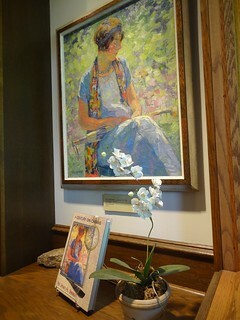 We were so happy when we pulled on the door and it opened, we step inside and pause to look around, it is quite lovely. Kris begins to take photos as I wander about. A couple of employees engage us in conversation, we tell them we are fond of old buildings, they smile and tell us to have a look around. One man acts as our guide and takes us from room to room, I’m always excited when the big key ring comes out and we get to see spaces not generally open to the public. There is lots of wood and ornate plaster, a fireplace takes center stage in one of the small rooms. 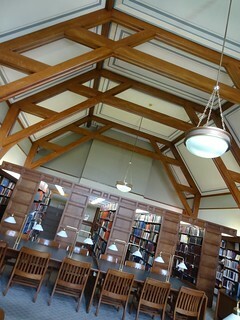 Completely renovated in 1997, new lighting was hung, old wooden shelves were replaced and computers were installed all the while maintaining the original Victorian motif. 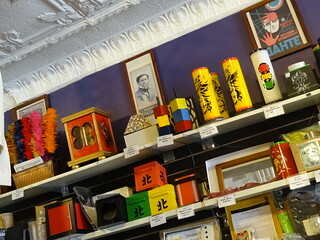 If you’re ever in town be sure to stop in and have a look around. It is late afternoon and we have yet to have lunch, we are starving! We take a drive through downtown but have no luck finding anything open on a Saturday. 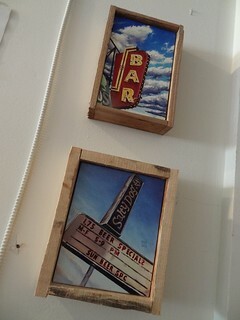 We cross the river and scan the area for somewhere to eat; in no time we find ourselves at the Old Town Drive-In. This charming old-fashioned car-hop restaurant has been serving up their homemade draft rootbeer, rootbeer floats and coney dogs since 1940. The outdoor spaces are filled, so we decide to eat inside, a row of swivel bar stools line the counter, we have a seat and quickly decide what to order. Before we know it our food arrives; a coney dog, a cheeseburger and fries. 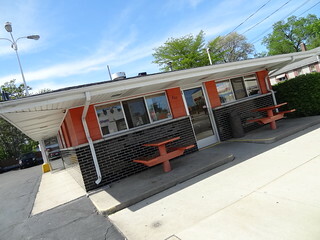 We always like to try out the coney dogs at these cute family owned drive-ins, each has its own distinct coney sauce. 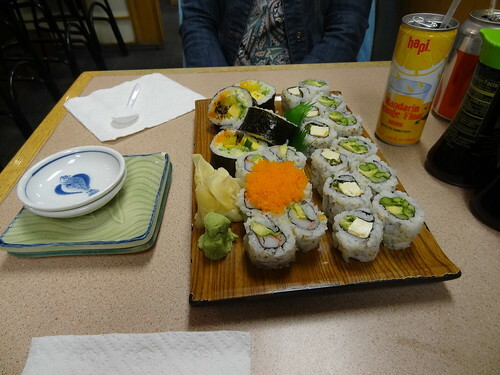 Everything is good, we polish off the meal quickly. 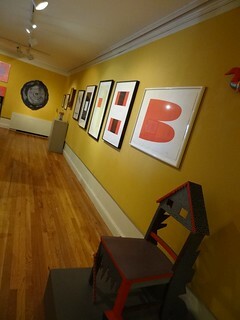 We make one last stop in town at the Saginaw Art Museum on Michigan Ave. 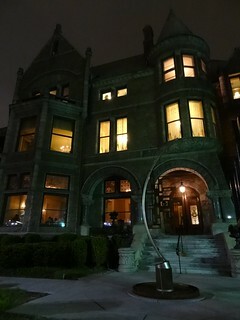 The museum is housed in the former Ring family residence, built in the early 1900’s in the Georgian Revival style, the family donated the home to the city. There is a buzz of activity when we arrive, a wedding is about to take place in the formal gardens. Inside we are slightly disappointed to find artwork removed and areas closed off, but the place is wonderful all the same. My favorite space is the former dining room, rich Butternut paneling adorns the walls giving the room a cozy feel. We proceed through the galleries, the collection contains about 1700 pieces, American and European art being the majority of the collection. 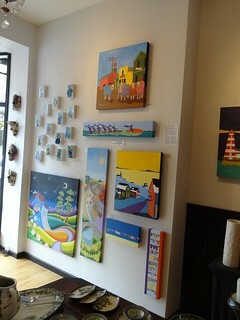 There is a nice variety on display today; paintings, sculptures, textiles and African art. One area of the modern and contemporary is filled with folding chairs this afternoon, ah, the wedding. The museum is currently closed for renovations and will re-open in the Fall, we look forward to a return visit when we will be able to see it in its entirety. 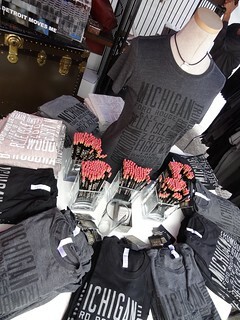 We have thoroughly enjoyed our visit to Bay City and Saginaw, there was so much more than we expected to find.